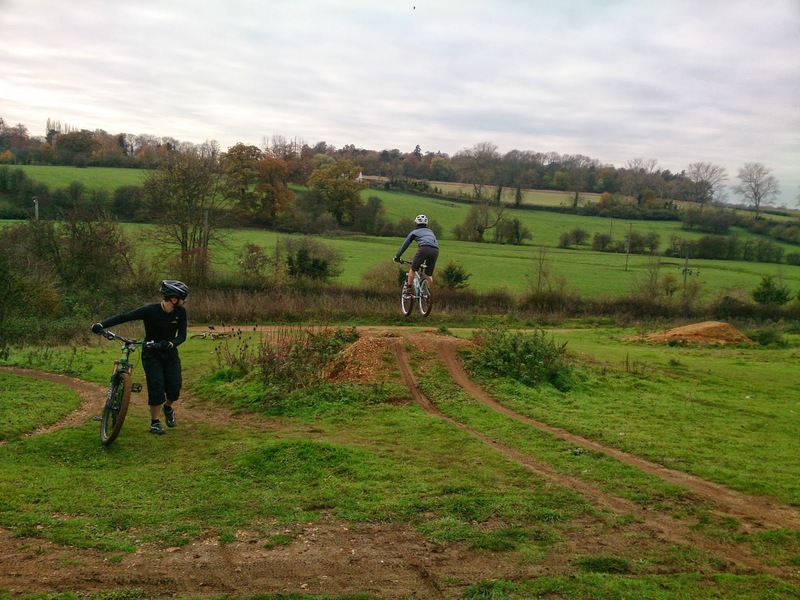 Pete, Andy, Ceriss, Tom, Alice and Sam arrived as planned, so once everyone was dressed and their bikes were built, we started with the skills checks. 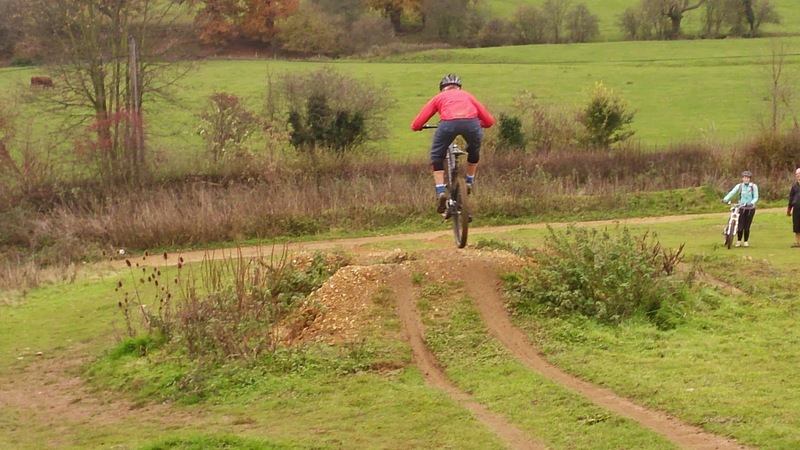 Here we described the foundation of cornering, and jumping and dropping. 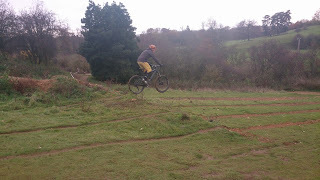 After a few set up changes, we moved on to put their new found skills to practise. 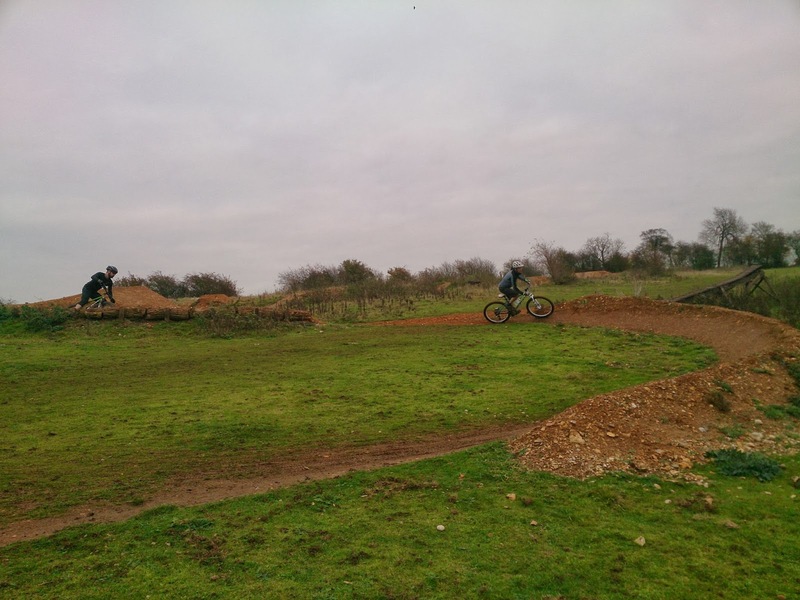 We started with the drop technique, where we explained the mental side of riding, and had them choosing whether to ride what is in front of them or not. 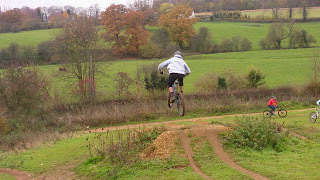 Before long, they where all riding the largest of the three drops comfortably, and some even started to add style when in the air. 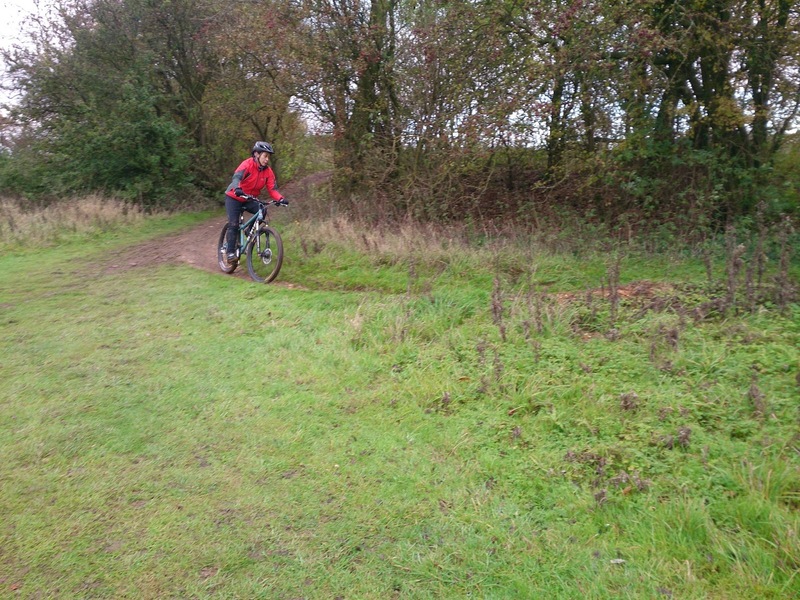 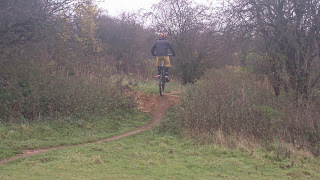 We then done a quick cornering exercise, before moving onto the trail. 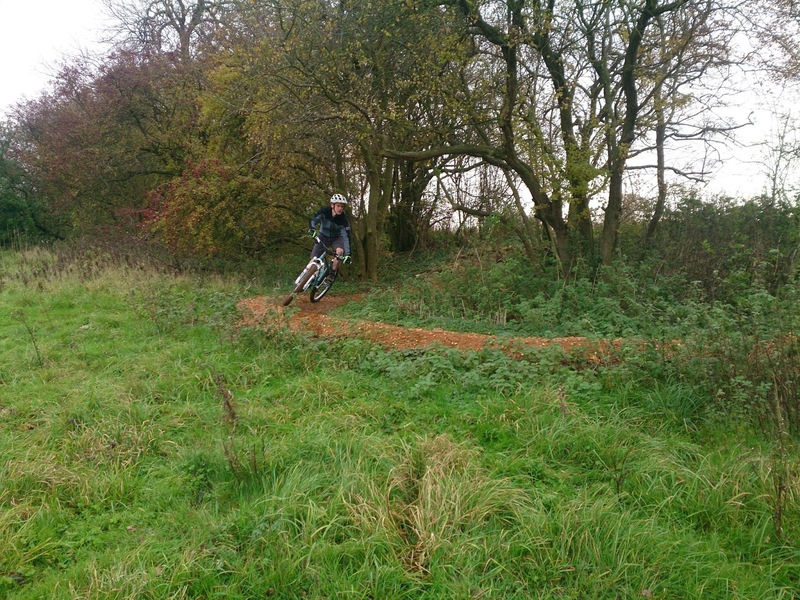 Here we walked them through and demonstrated each section, before allowing them to put their skills to the test. They where soon flying down the trail from top to bottom, linking both bermed, flat and switchbacked corners, rock gardens, fly outs, steps and drops. 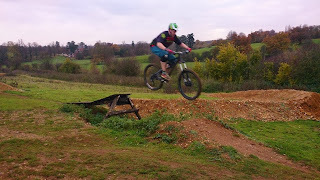 We then moved onto the table top, where we controlled everyones speed to match their jump technique. 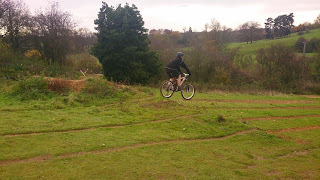 We sprinkled speed slowly and soon everyone was flying comfortably over the 6ft tabletop, and some rode the gap jump as well. We then moved onto the pump and jump trail, where they began pumping through sections in order to gain speed to jump other sections. 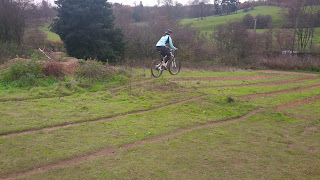 Some began to manual through the sections also. 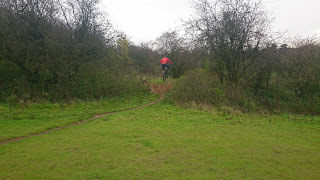 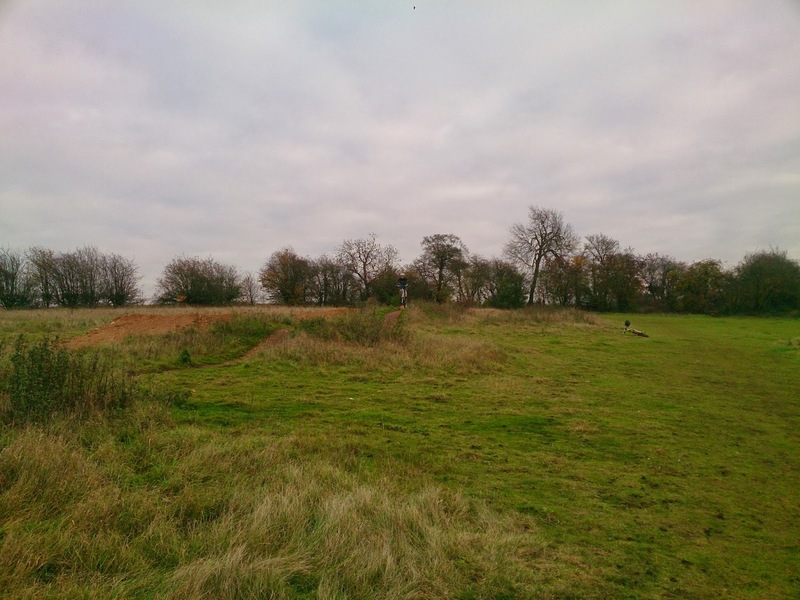 We then linked the first half of the trail to the last, or gave them the option of linking the two berms at the end of it. 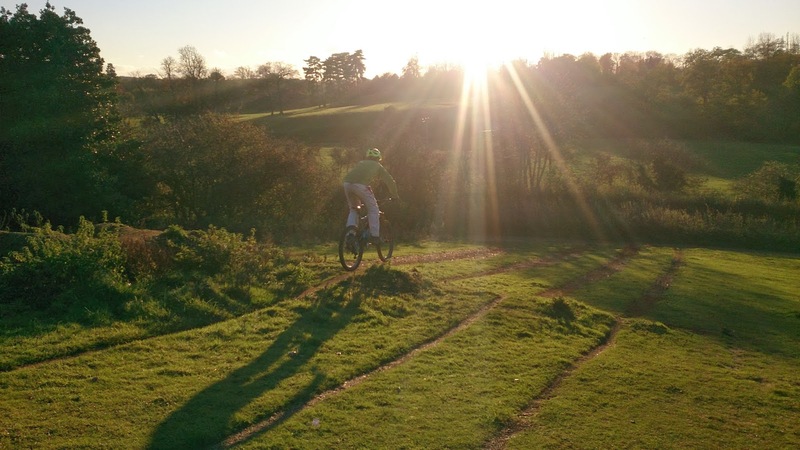 Mental tiredness set in, and we finished the session with a walk around the northshore, just as the sun was going down. 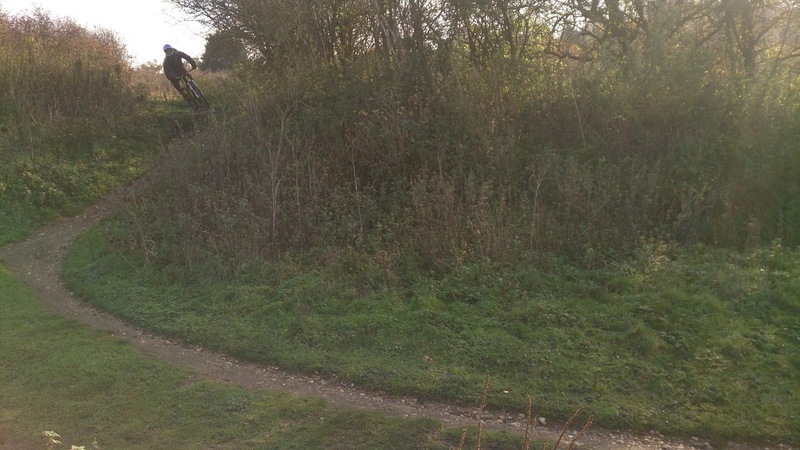 What an enjoyable session guys! 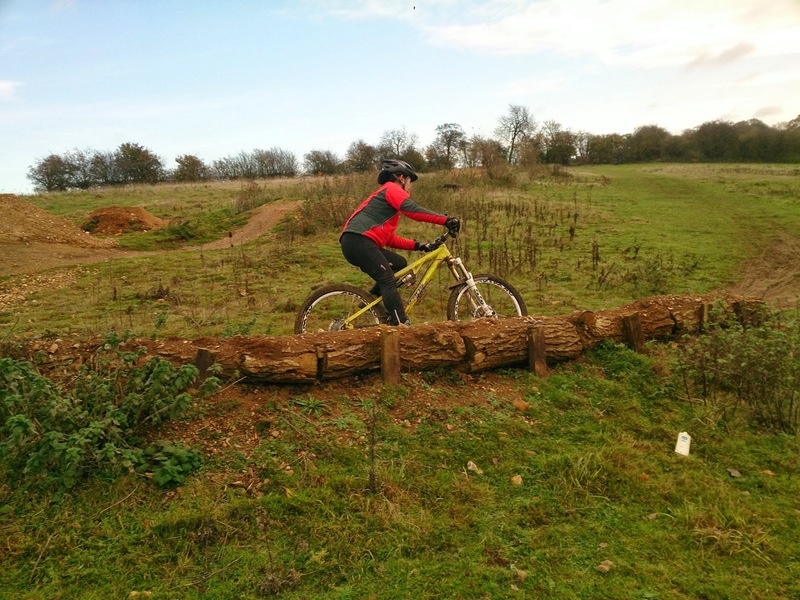 Mark arrived after recommendation from a friend and the skills check showed me that I needed to work on his footwork, body positioning and looking skills but also his concentration too. 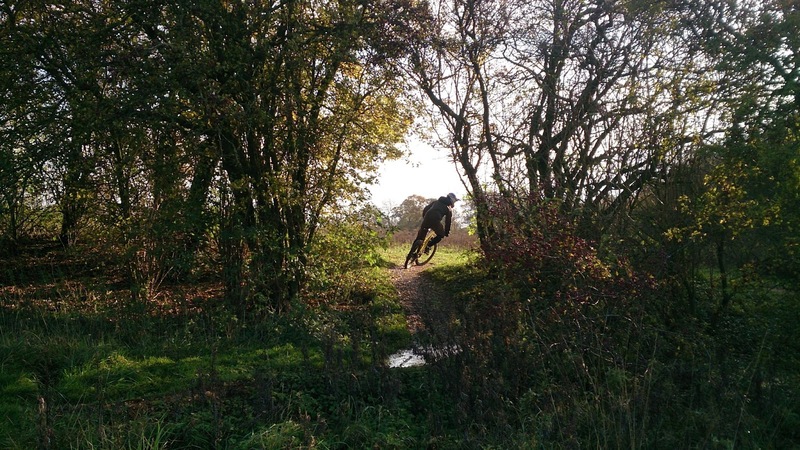 The effect was almost immediate as when we moved to the drops, he was landing perfectly from the word go and quickly rode all three. 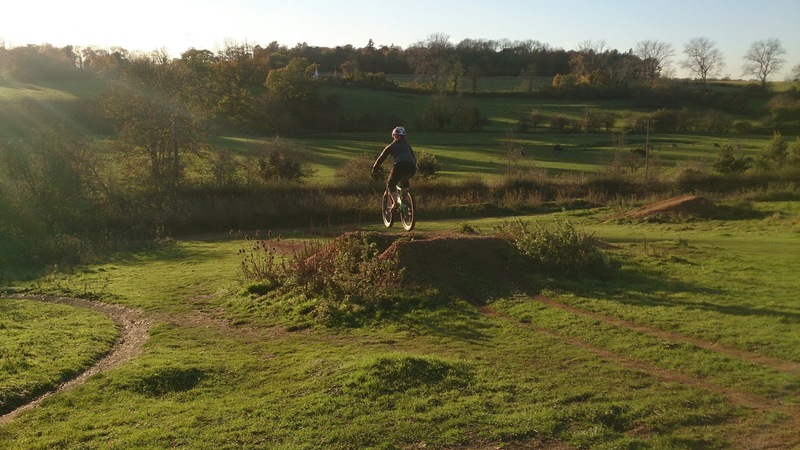 I moved him to the 6ft tabletop next as his bmx background came flooding back and he was amazed at how easy it was to clear the jump and used his mental skills to decide to ride the gap too. 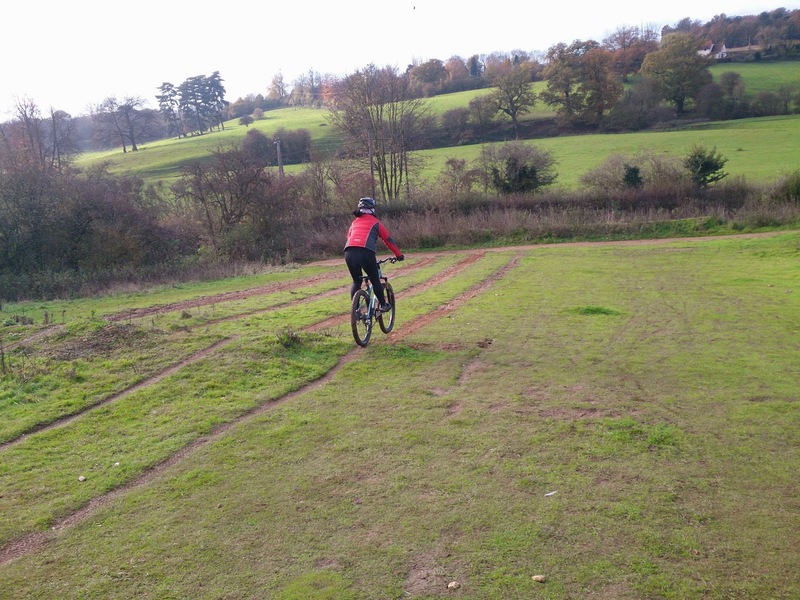 I could see the adrenaline running through him so we moved on to a cornering exercise to work on his body position and that really took him by surprise at how much more grip he now had. 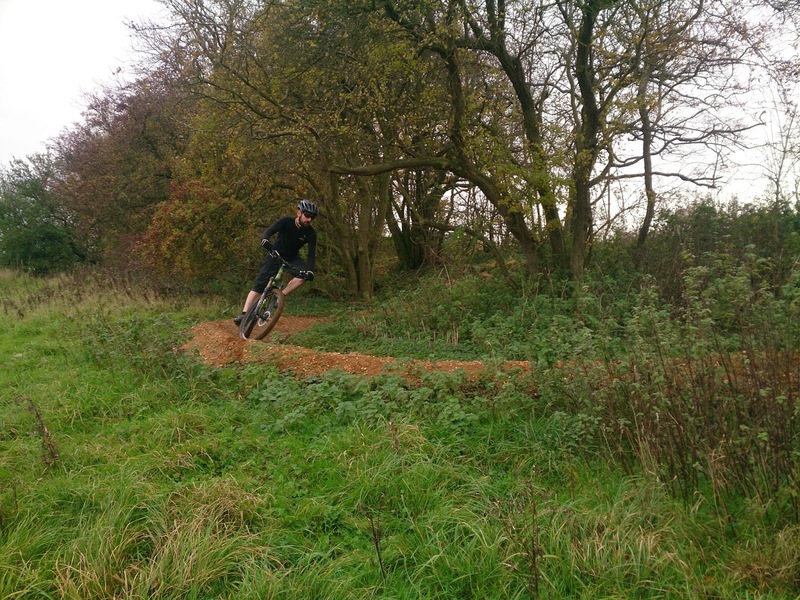 We moved to another trail to work on pumping and jumping and choosing the best technique and why and soon he was flowing nicely. 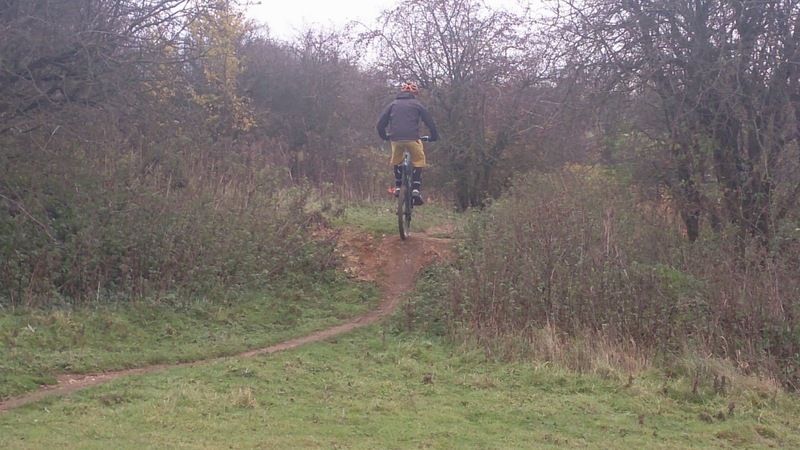 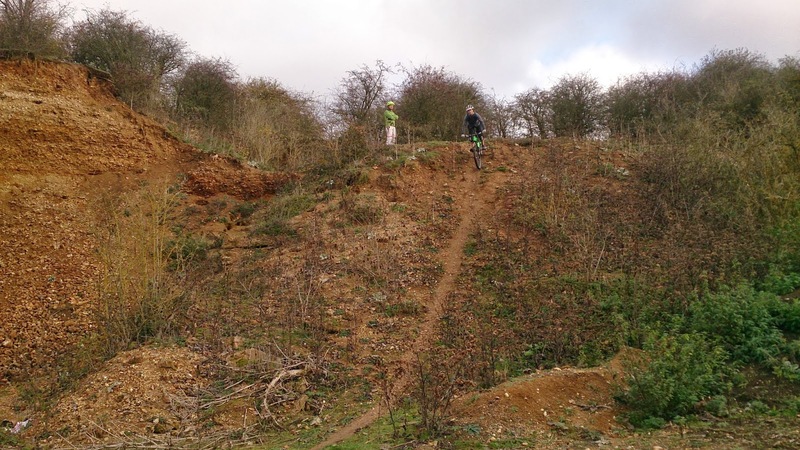 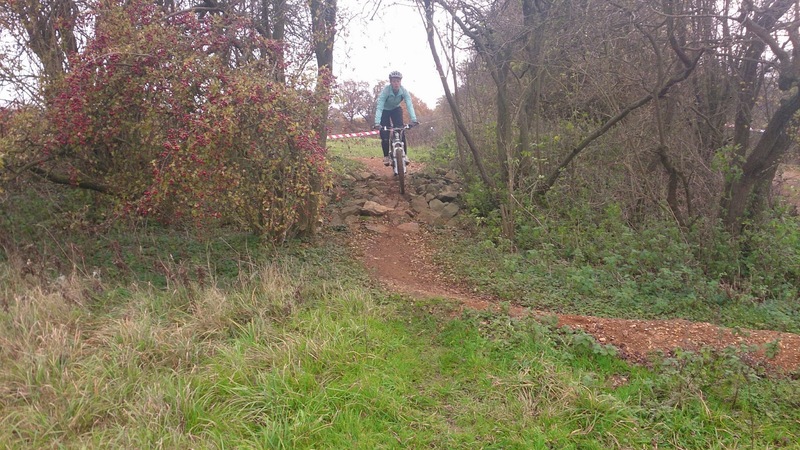 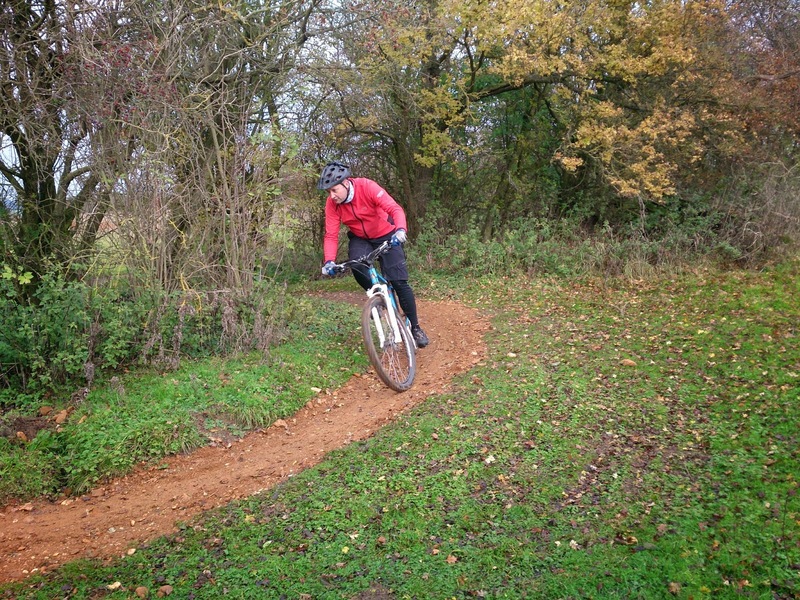 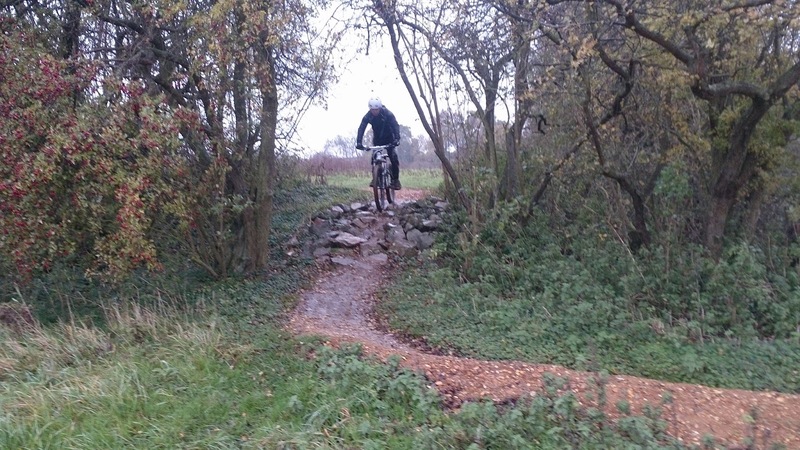 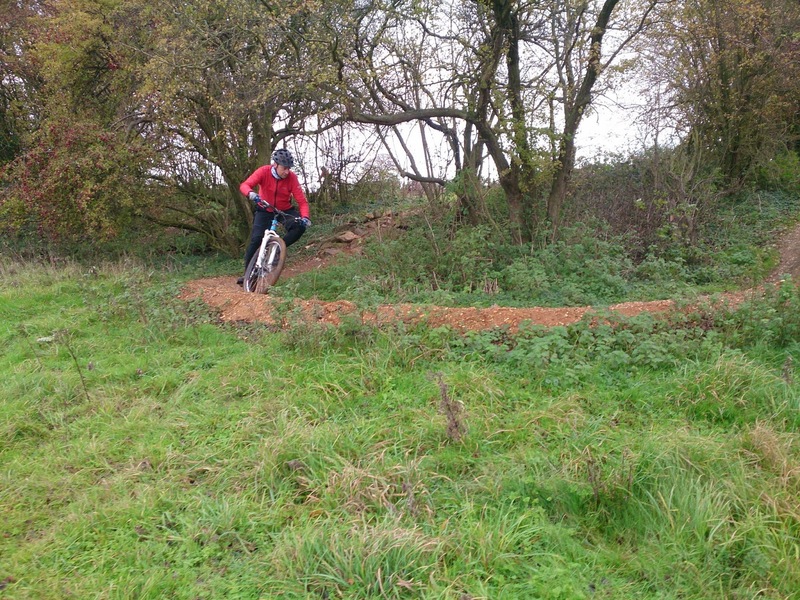 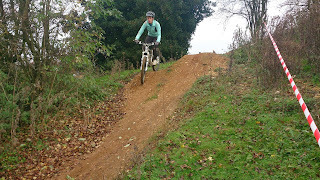 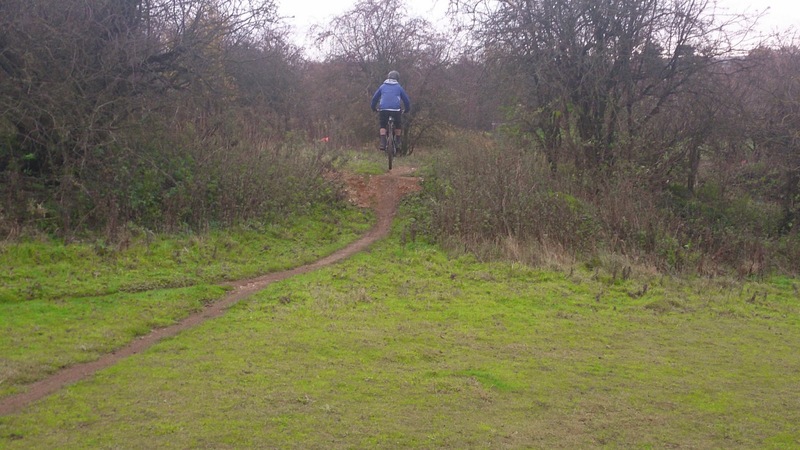 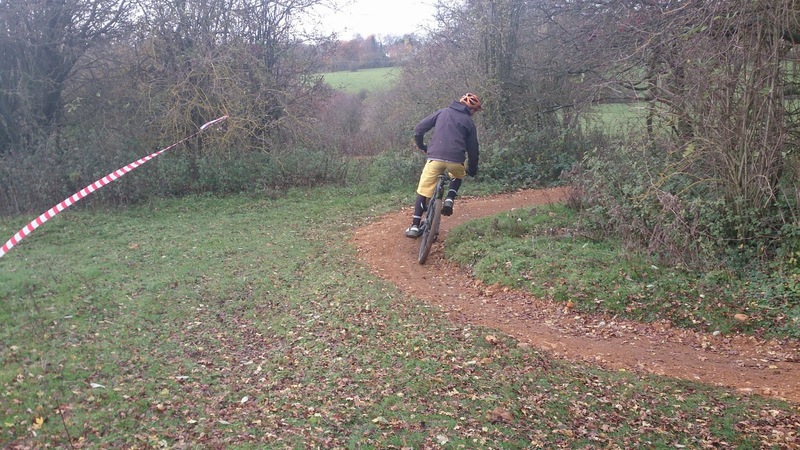 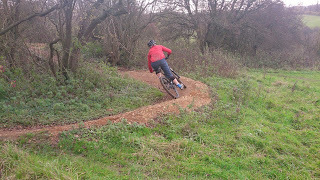 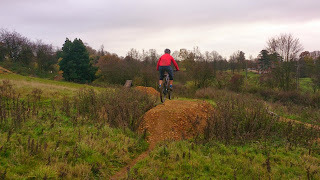 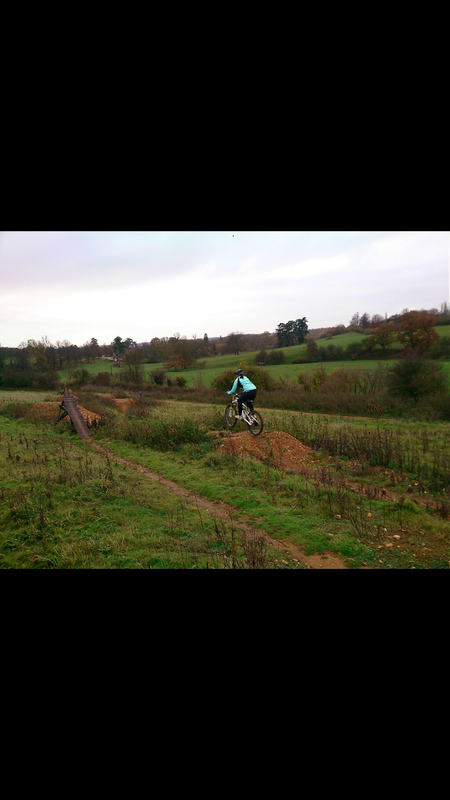 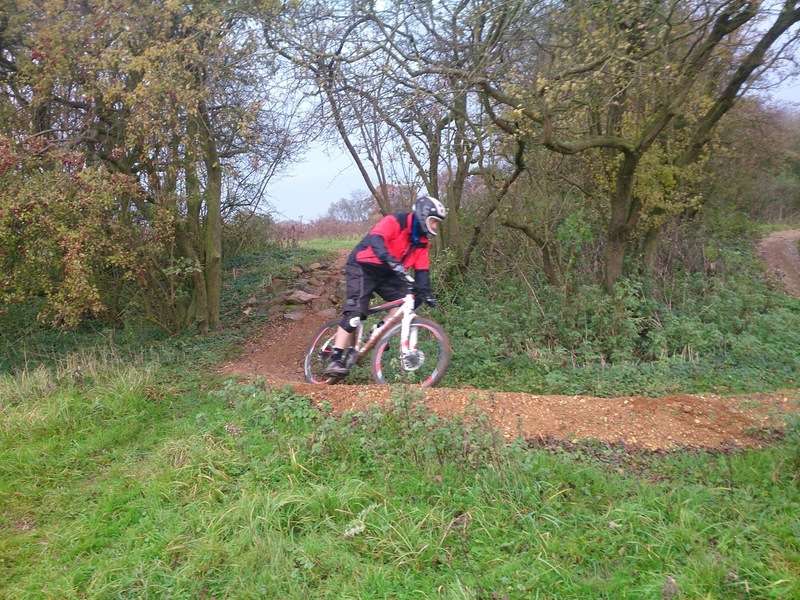 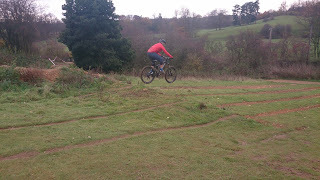 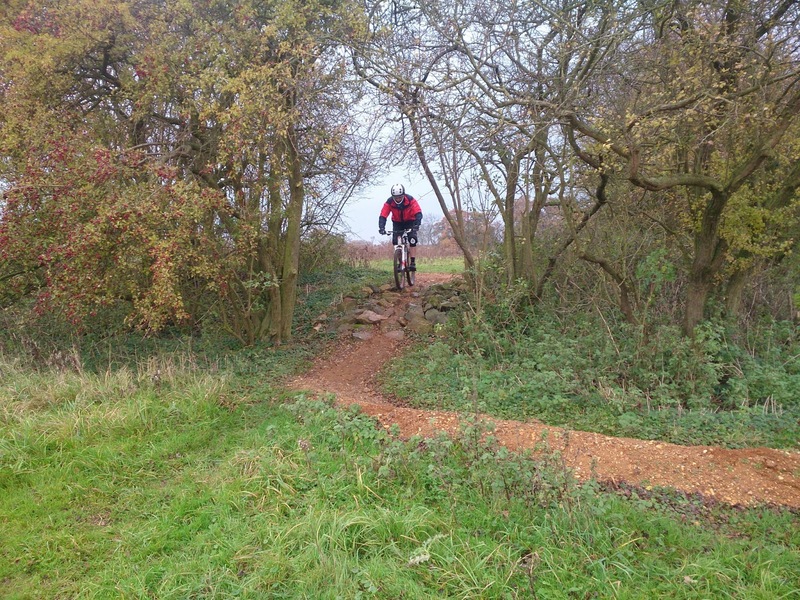 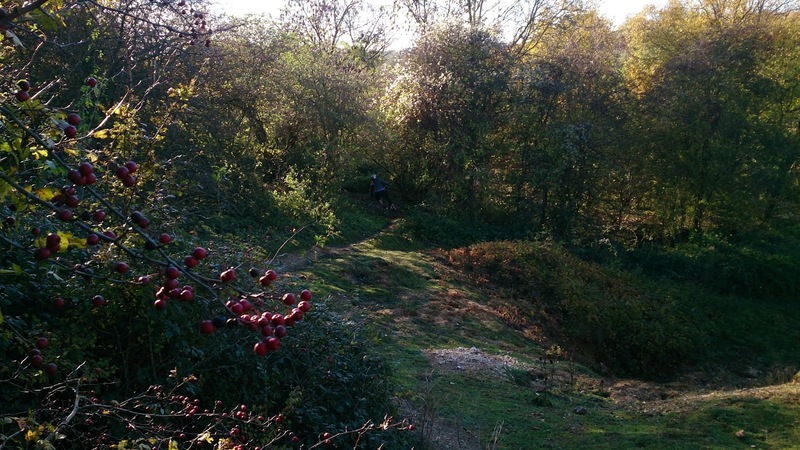 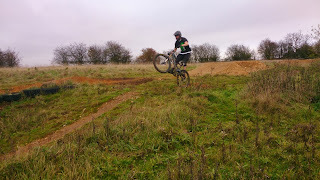 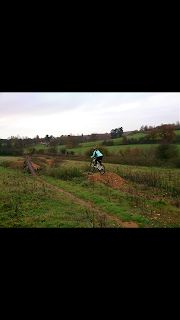 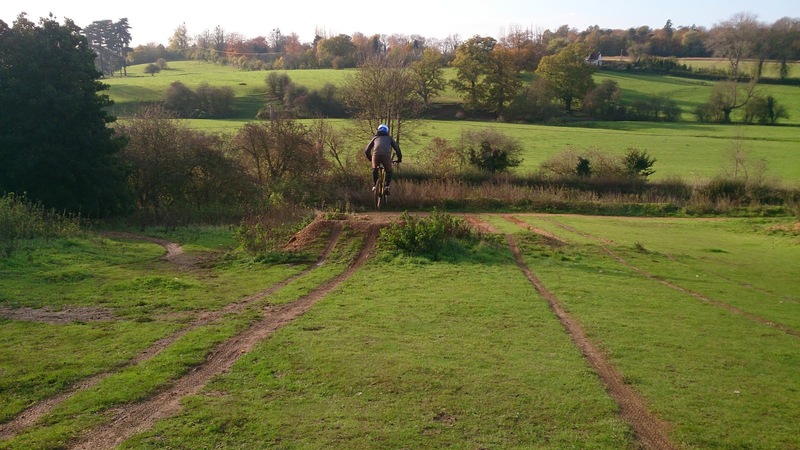 I moved onto the skills trail and we worked on the top half first to work on rock gardens, pumping and cornering. 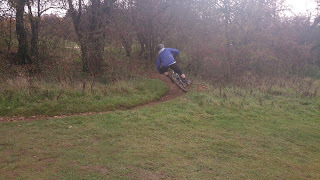 Later we added the bottom half of the trail to it and he was riding the 14 sections smoothly. 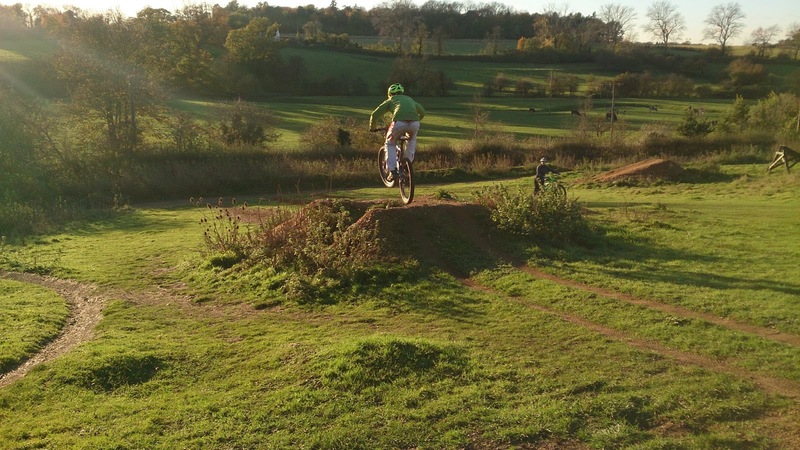 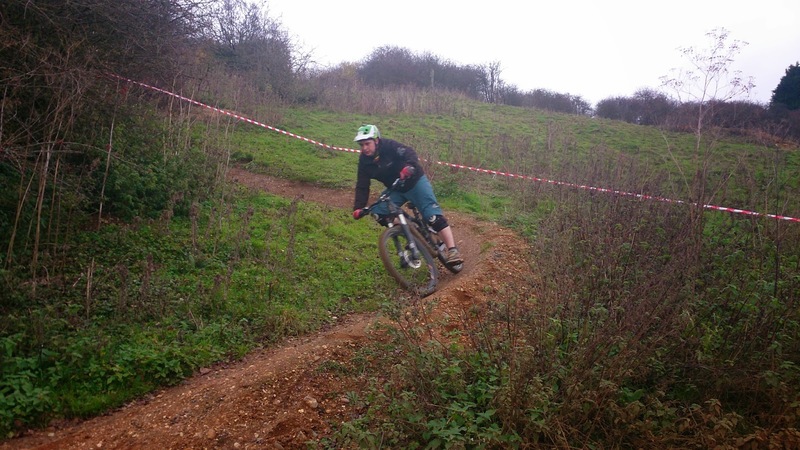 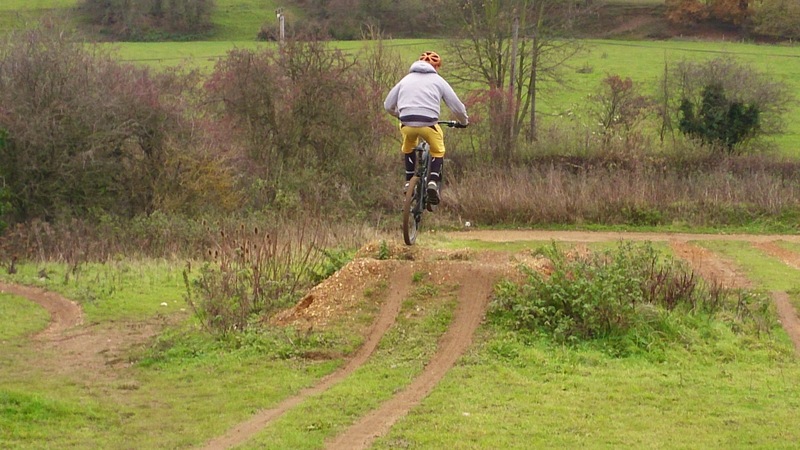 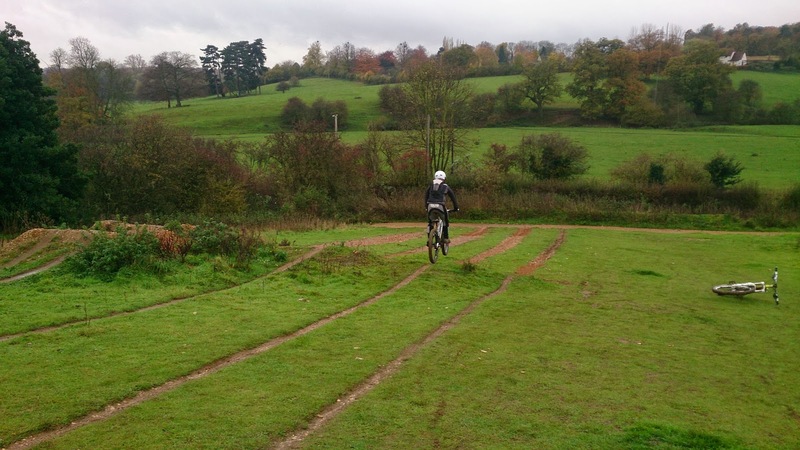 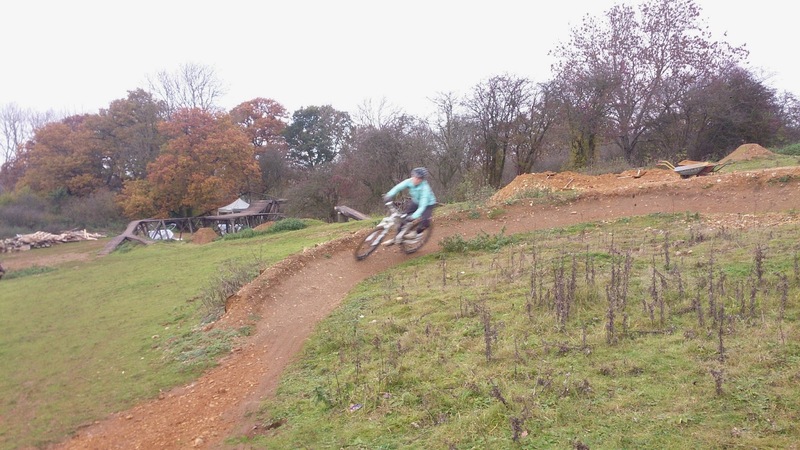 berms, flat, off camber and switchback turns were linked to drops, jumps, pumping and rocks. 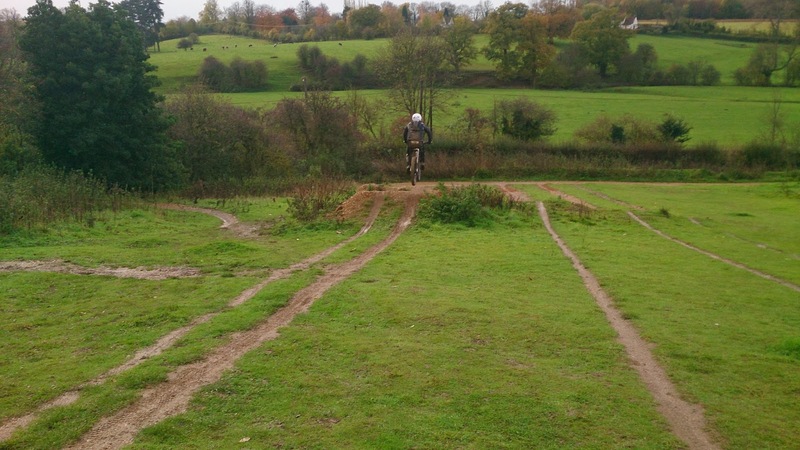 A rider error in a flat corner made Mark wash out and he hurt his wrist that he couldn’t comfortably hold onto his grip so we called an end to a great session. 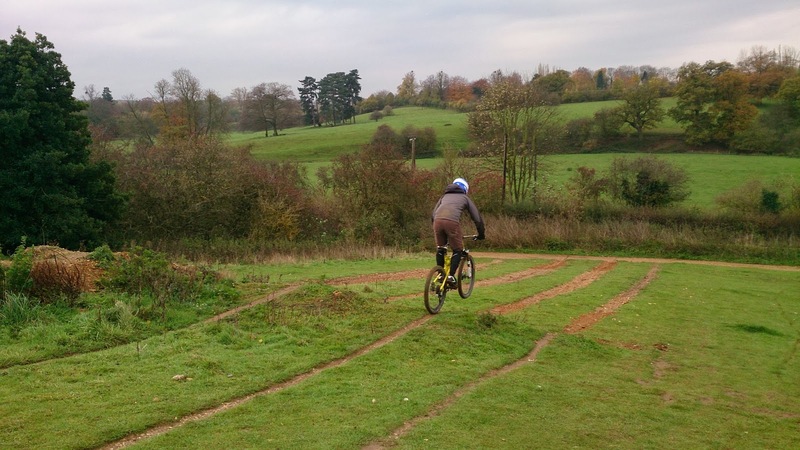 Rik and Tom herd about my coaching online and booked a session and today was the day. 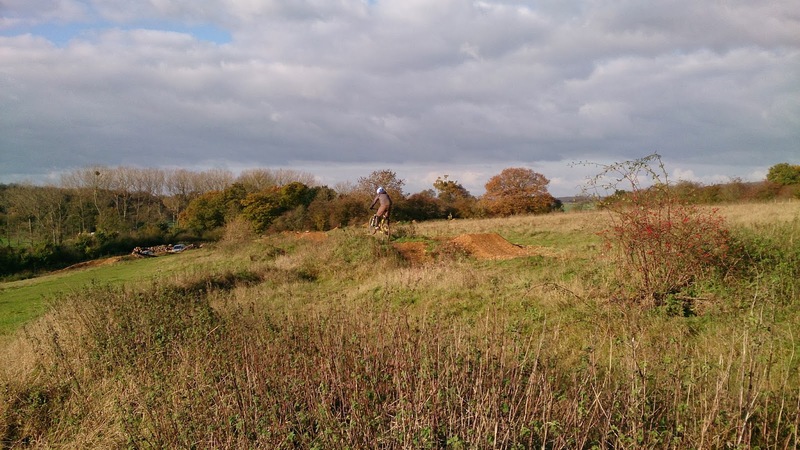 The skills check showed me the finer points in their riding and I knew what areas to correct physically before working on the mental aspect of riding. I began with the drop technique and here they had to rewire what they thought they should do and soon they were flying and landing perfectly. 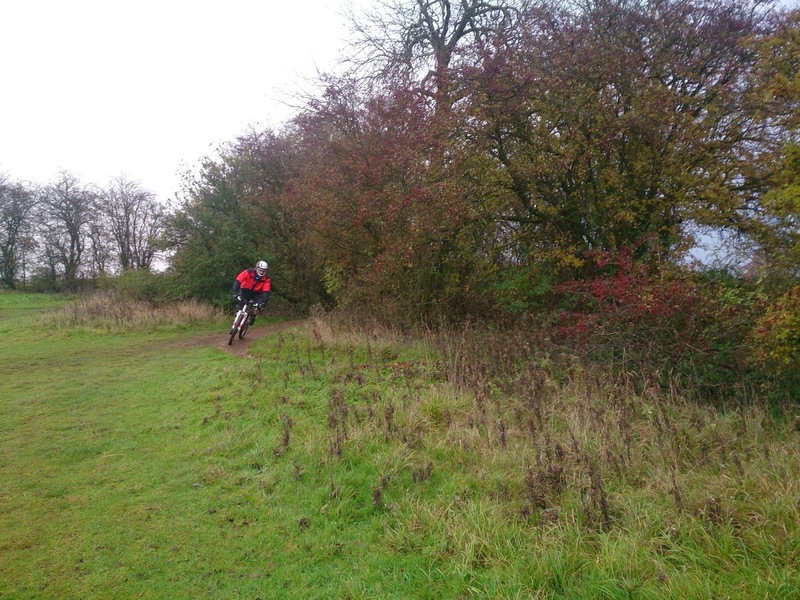 A cornering excersise was next, and they really got grip on a wet hill side using footwork and body positioning which we later applied to the skills trail. 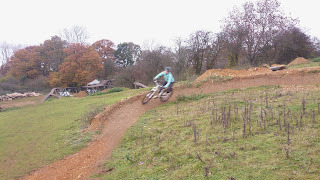 Flat, bermed, off camber and switchback turns were linked to fly out jumps, drops, steps, pumping and rock gardens and over the next couple of hours we broke it all down and then rebuilt their riding. 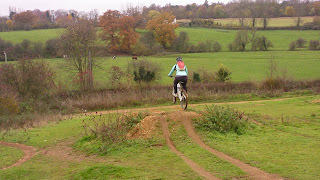 Soon they were riding the trail end to end and each run was smoother and faster than the previous. Onto jumping tabletops and I knew I’d have to work hard on Tom’s mental skills as a series of crashes over the past 2 years had diminished his confidence but in a few small steps both he and Rik were sailing the 6ft tabletop and Rik rode the gap jump side a few times too. 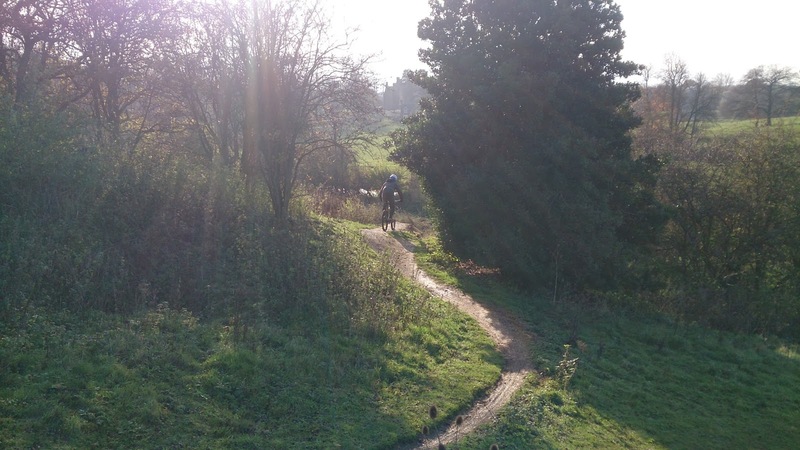 I moved them onto another trail to work on pumping and absorbing sections on a trail and linking all techniques of the session together. 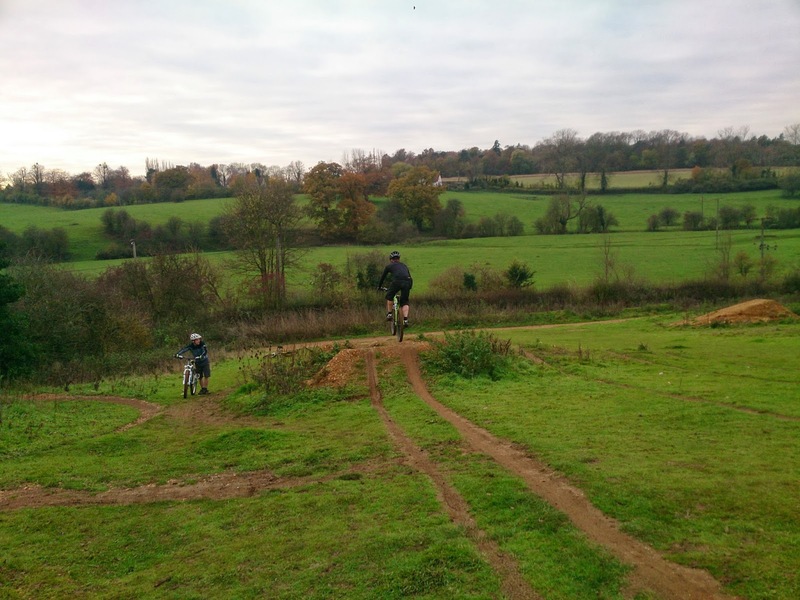 They were tiring mentally but I was able to demonstrate manuals and they soon were linking 14 sections on a trail together and carrying speed. 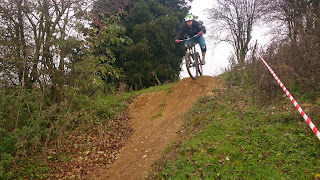 By the end of the session they were jumping way more comfortably than ever and with big grins. 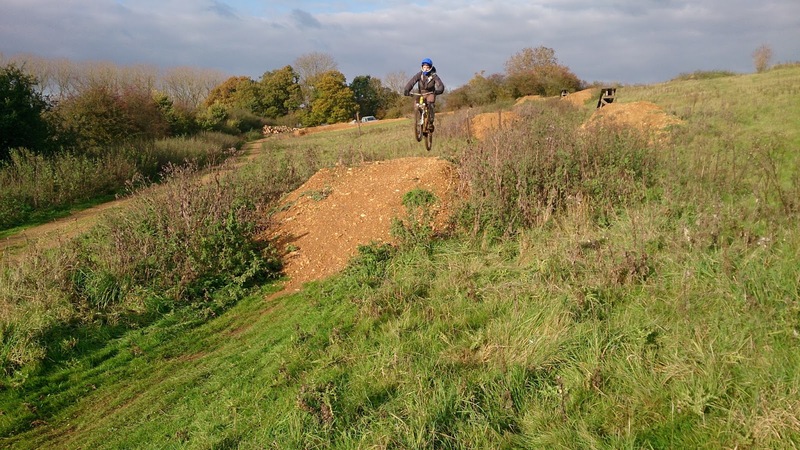 James and Tina had a session with me 3 years ago and they were so happy with their riding progress over the years since but a loss in confidence whilst riding abroad this year made them contact me for a refresher. 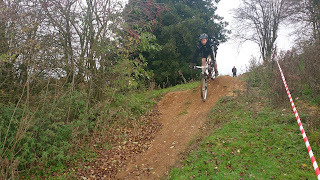 I found they needed footwork and body positioning re installed and that I’d have to work on their mental skills too. James was loving the drop technique and it took me quite a while to gradually reintroduce the body position to Tina as she had become protected and sat far back on her bike. 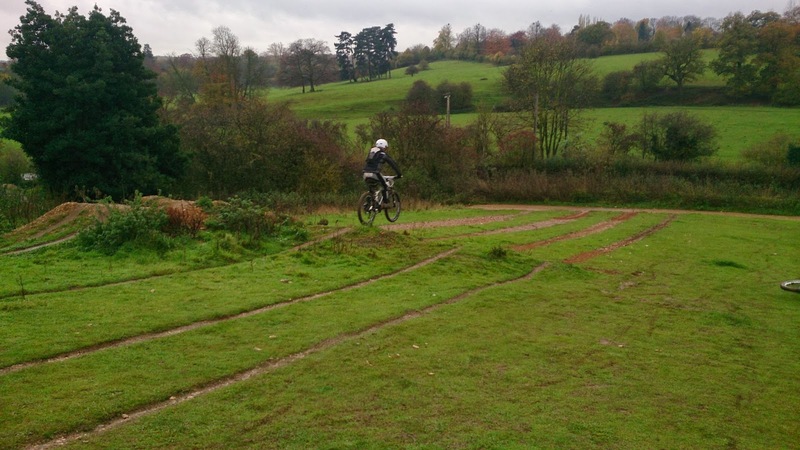 Soon they were both in the air and landing both wheels down and the smiles grew and grew. 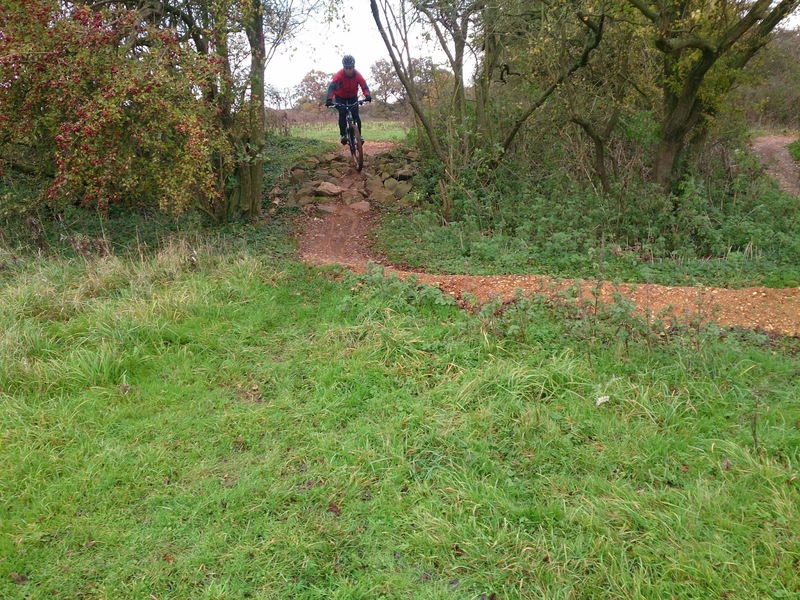 I wanted to work hard on their cornering and carrying speed through a rock garden which is something they both were uncomfortable last time but now they were riding more comfortably. 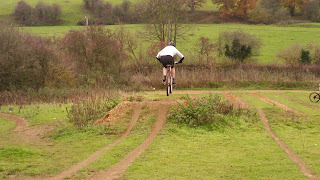 Onto another trail and I worked on carrying speed through multiple sections on a trail and pumping away from them, James was choosing which to pump or jump as he made his way along the trail and they both carried their speed through a berm using their corrected skills farther than they could have before. 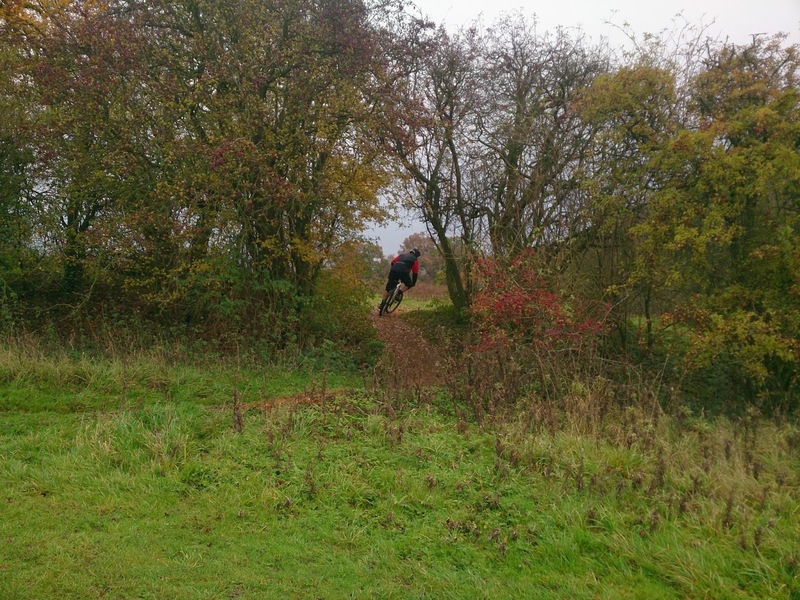 I knew Tina was tiring and it wasn’t before she’d had a few completed runs of the trail more than she called an end to the session due to tiredness and James agreed. 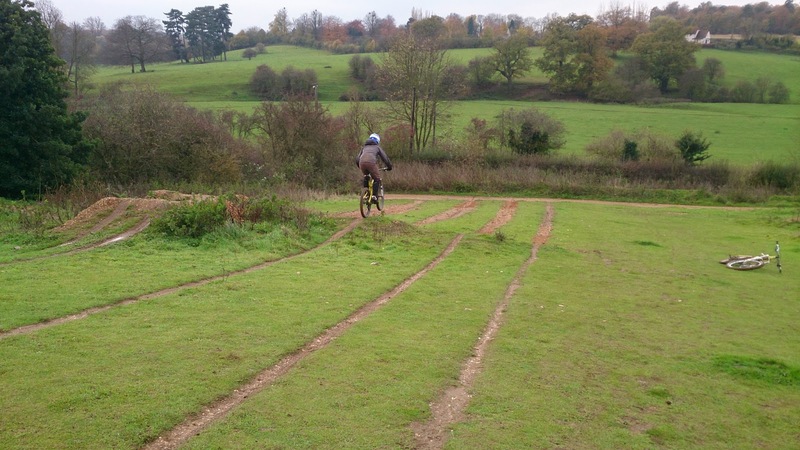 Joe came to me after a series of crashes whilst jumping had affected his riding. 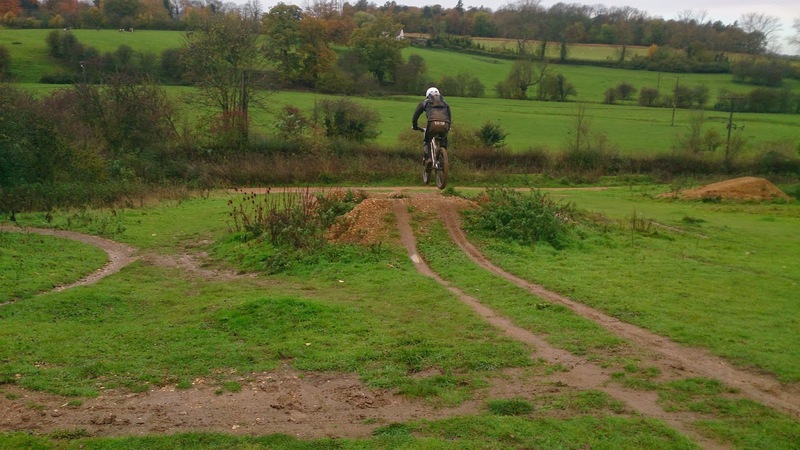 The skills check showed me a competent rider that needed his looking and body positioning polished but I knew I’d have to work on his mental skills too. We began with drops and soon he was smiling as he sailed through the air off a drop that he’d have thought twice bout before. 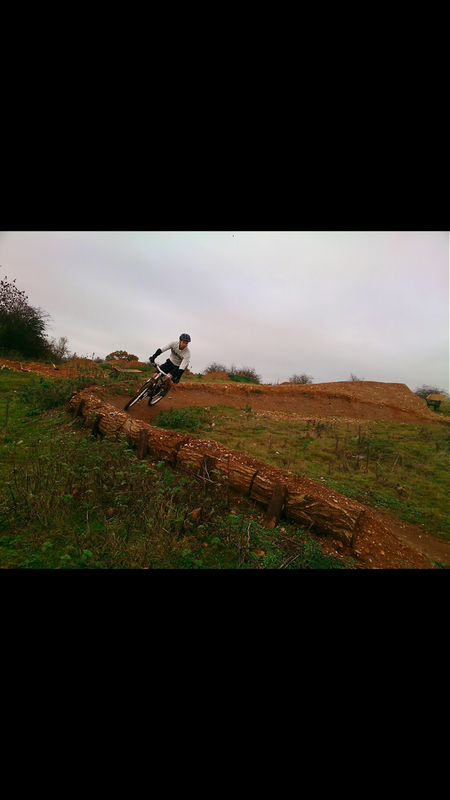 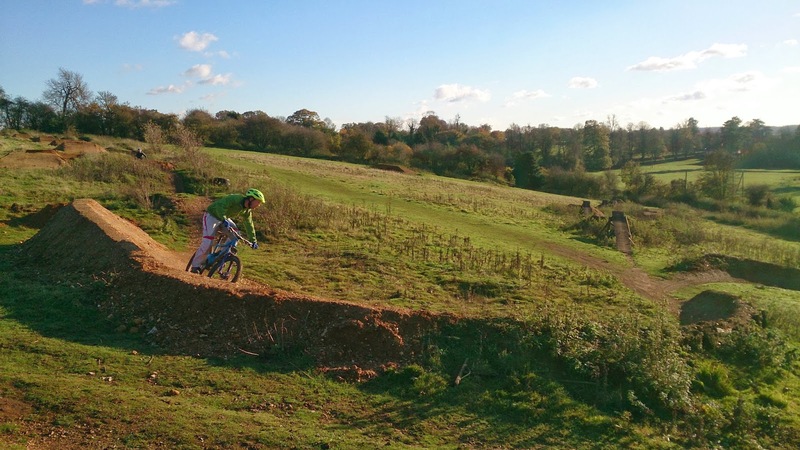 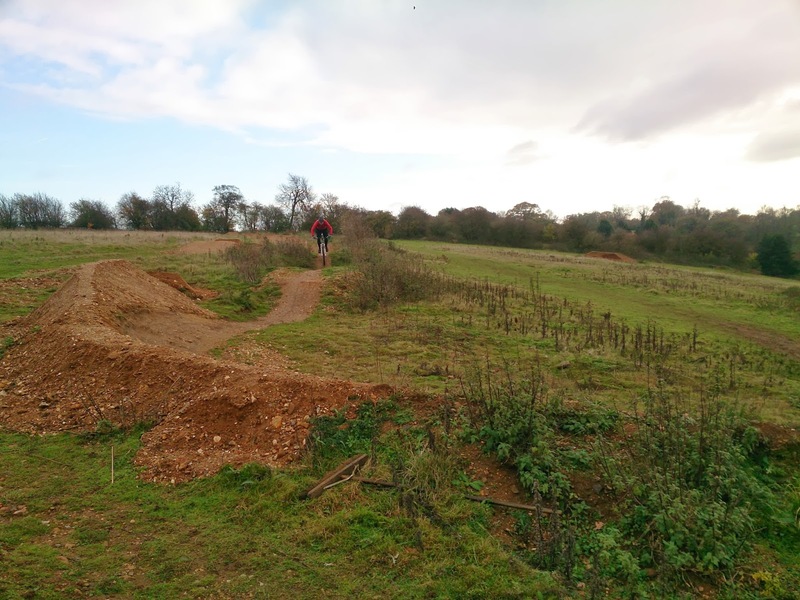 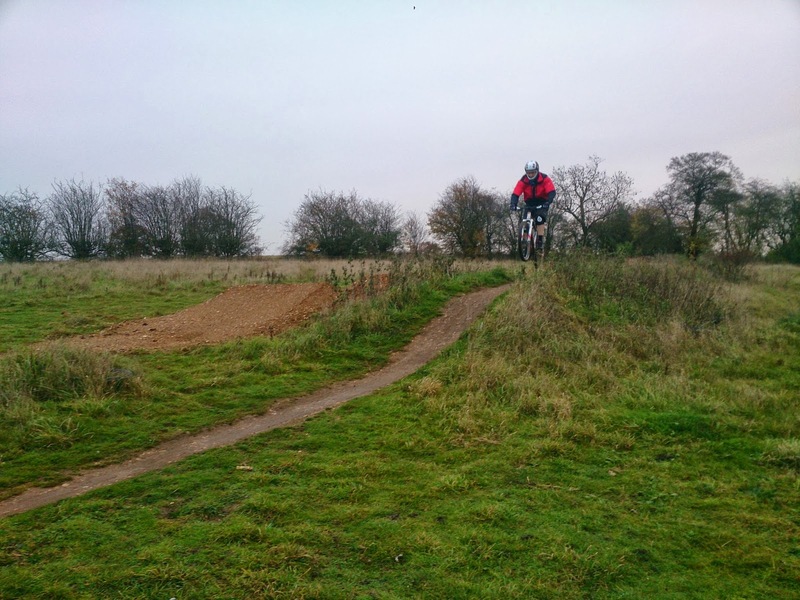 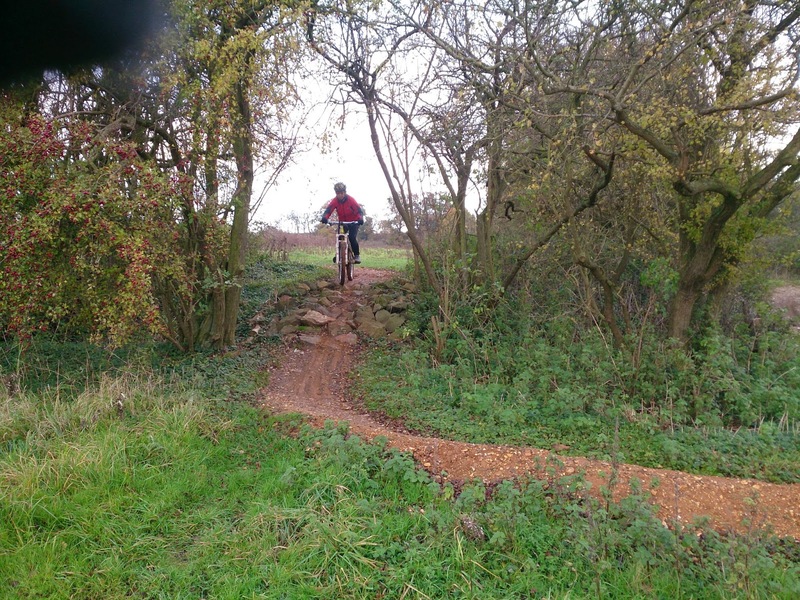 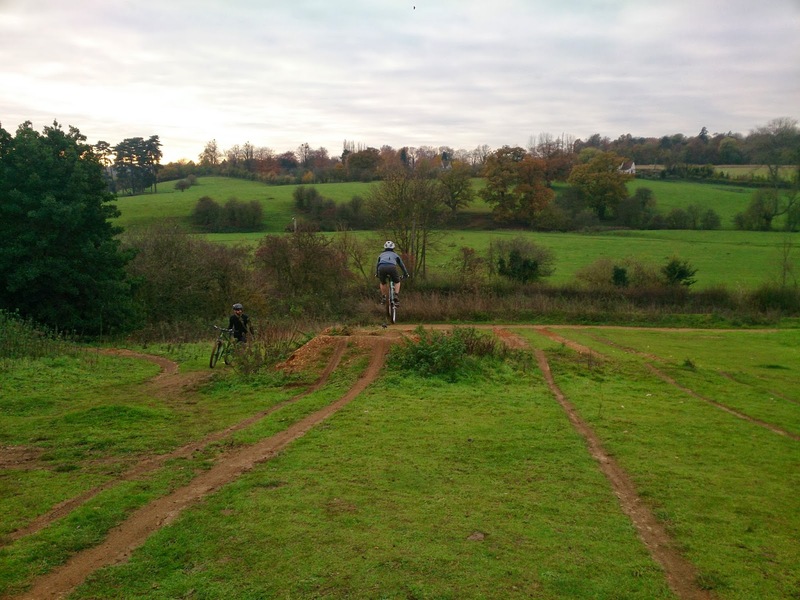 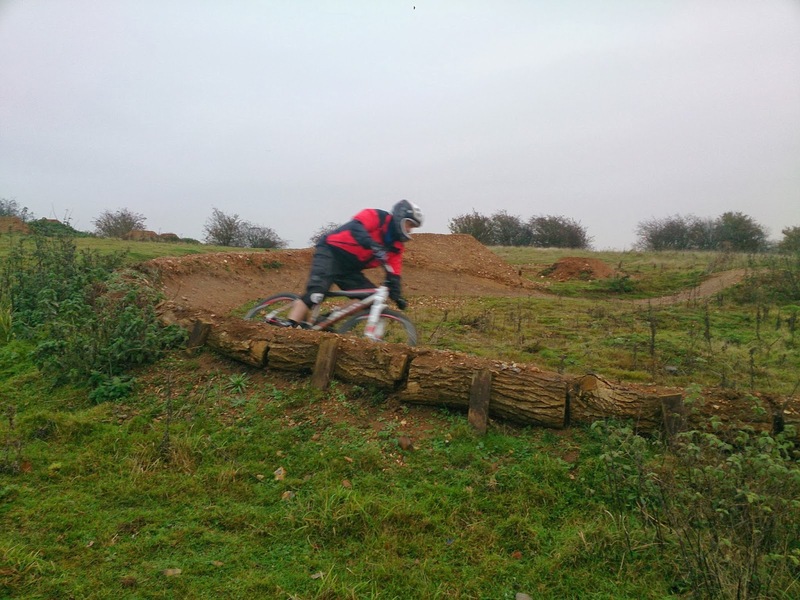 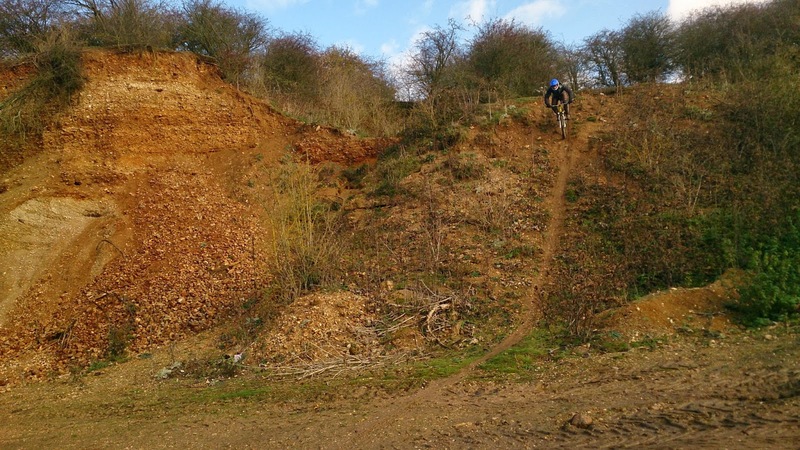 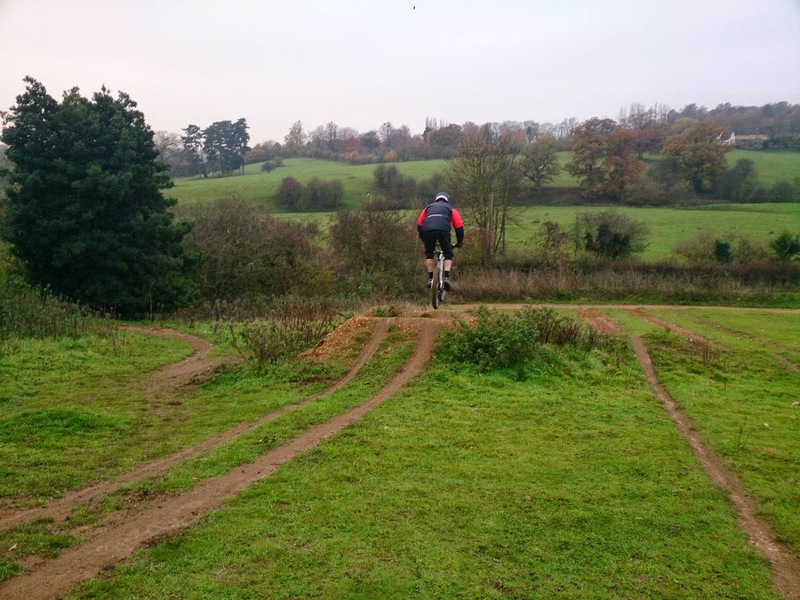 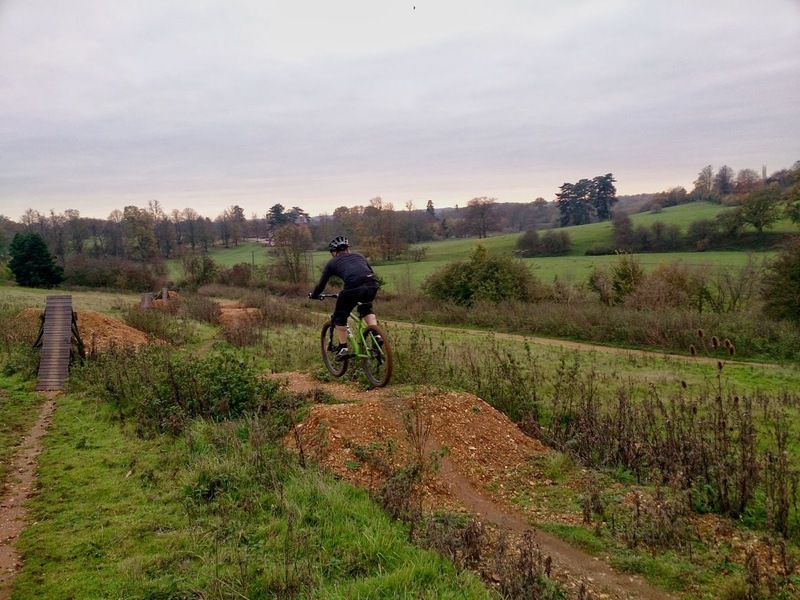 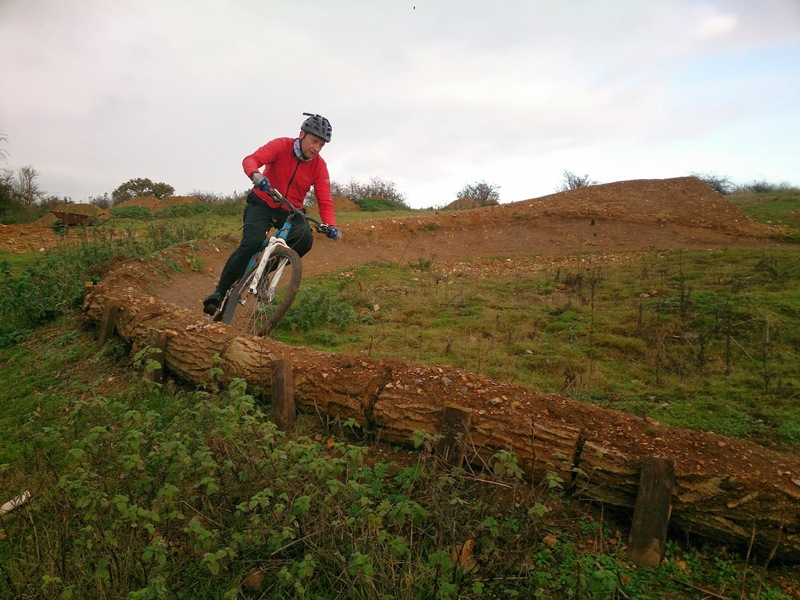 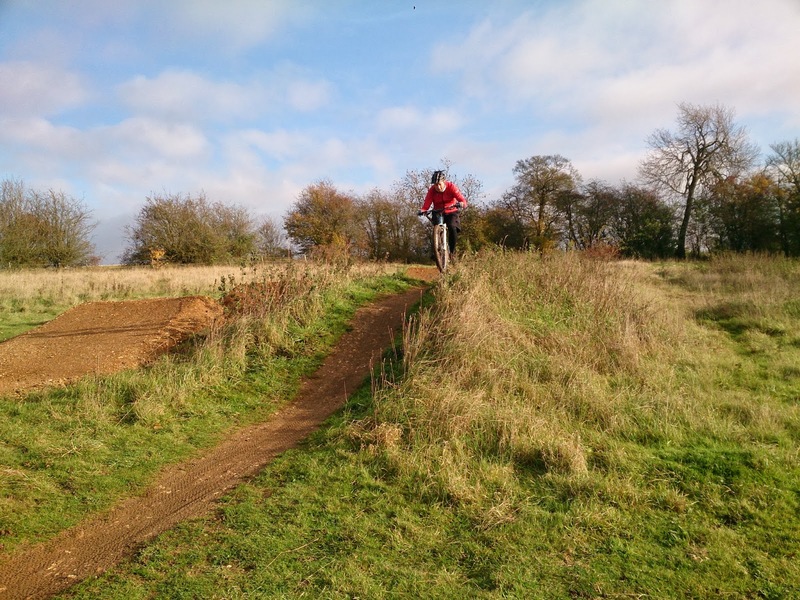 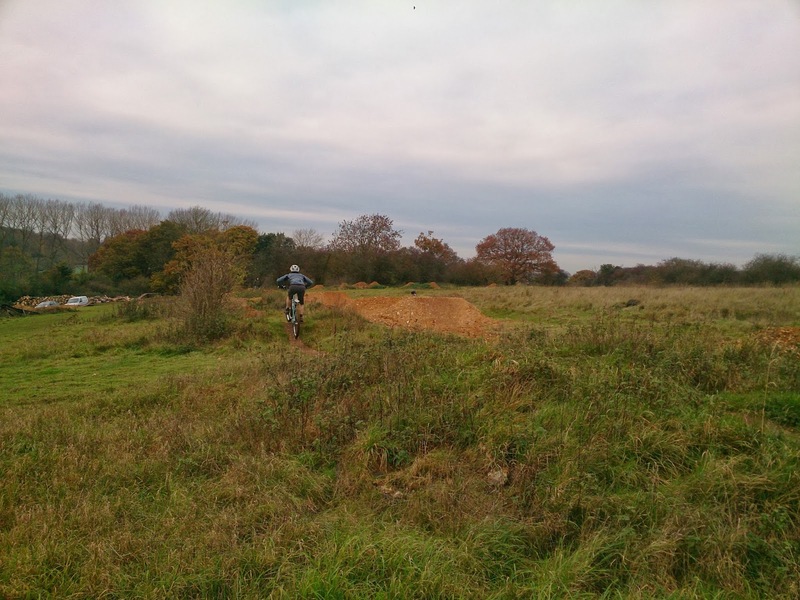 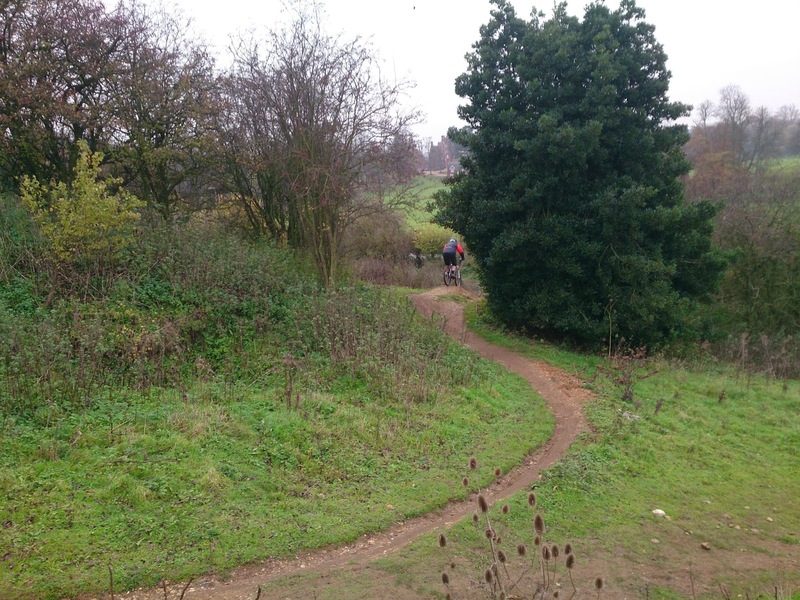 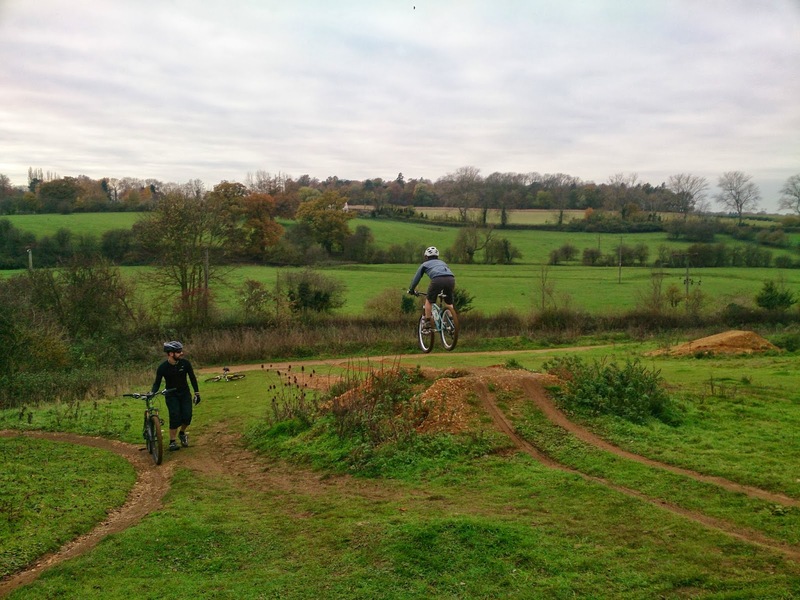 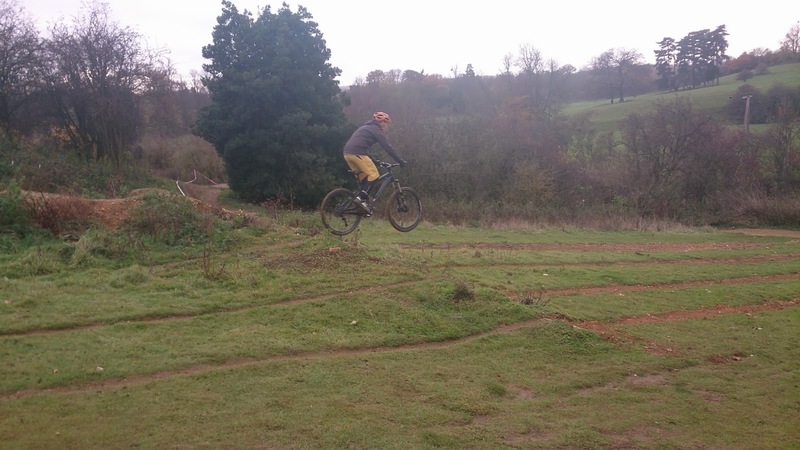 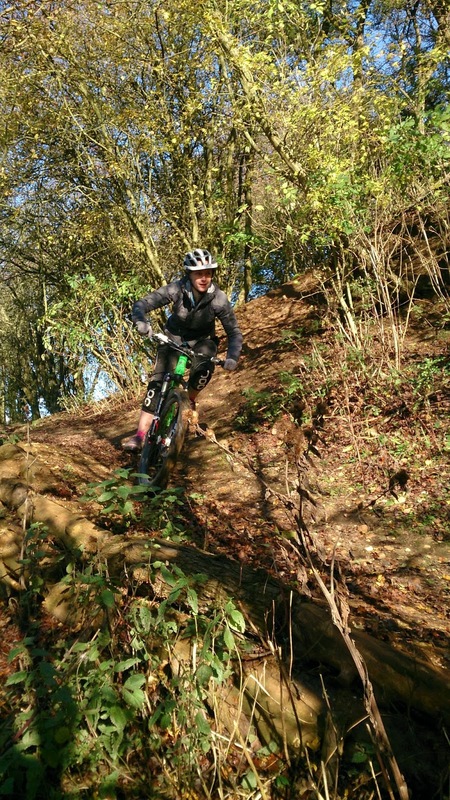 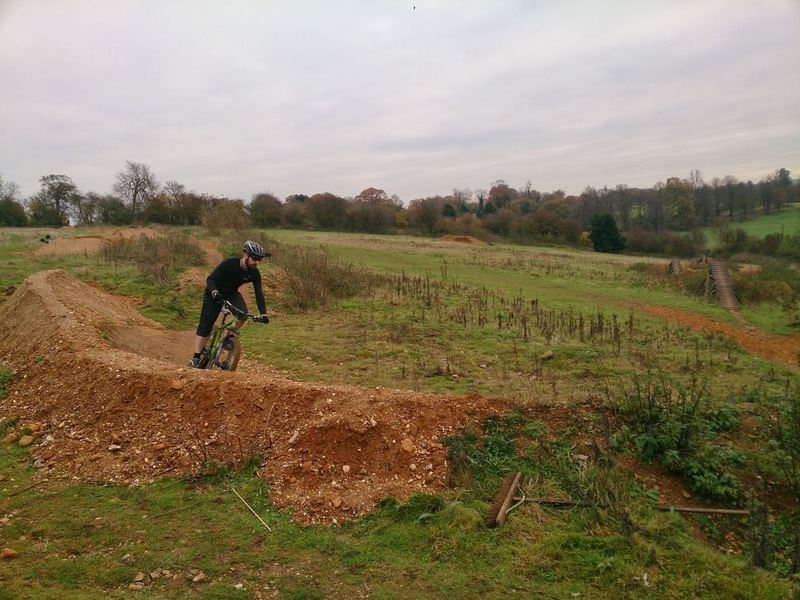 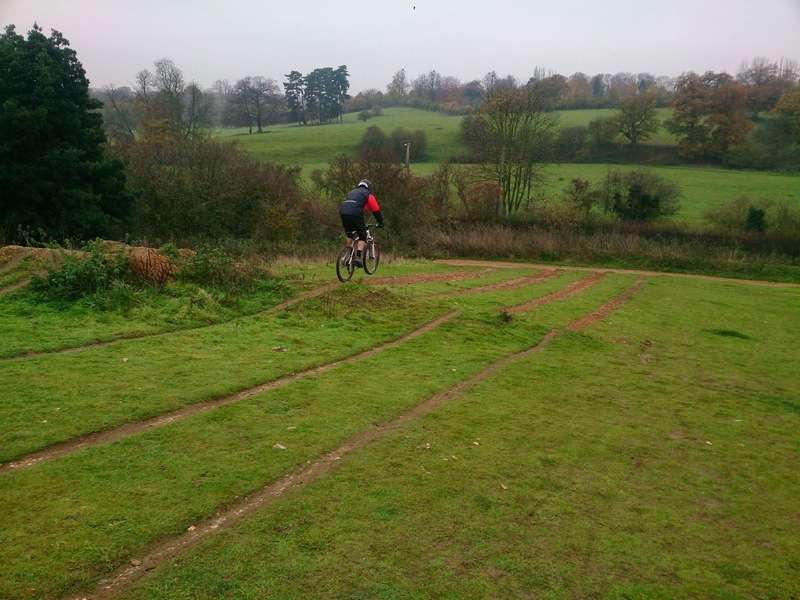 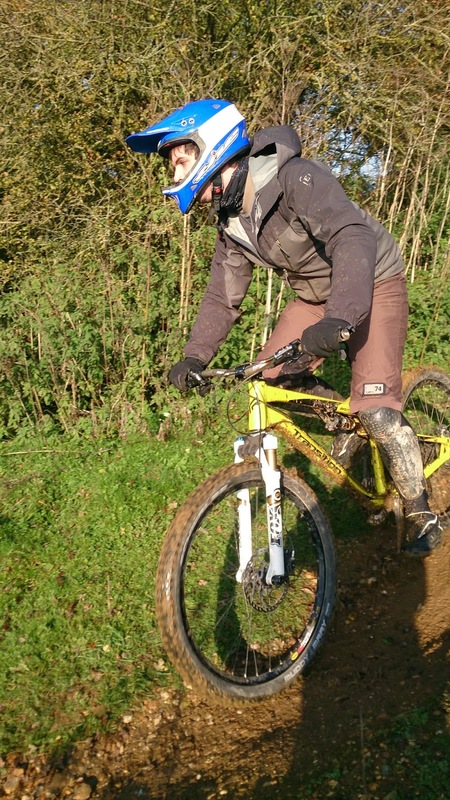 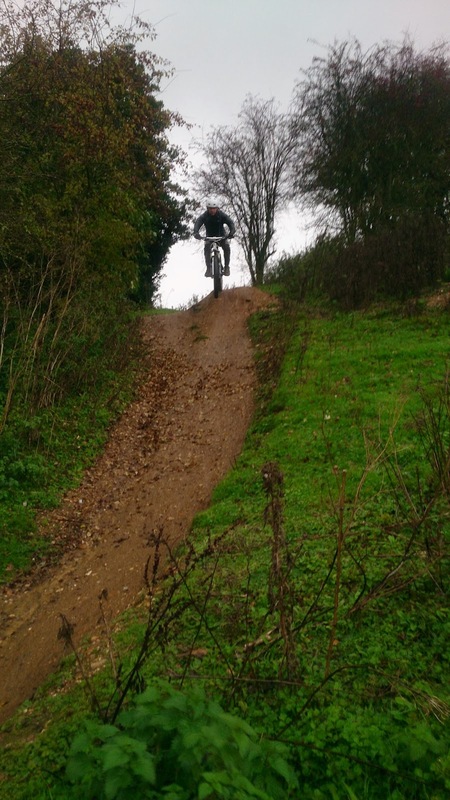 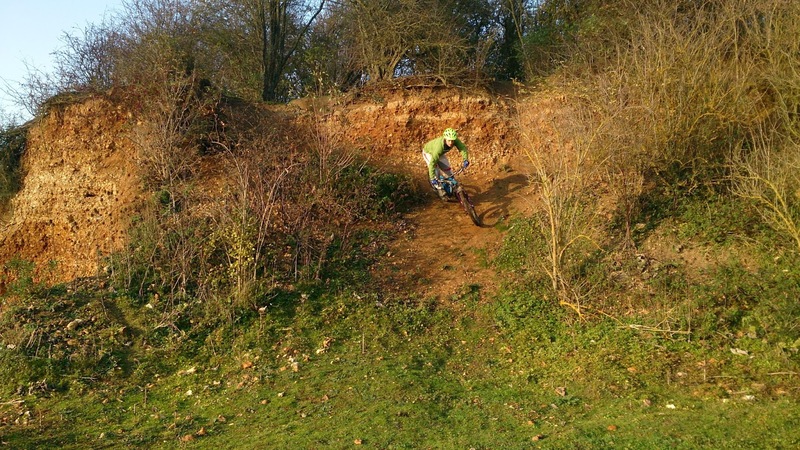 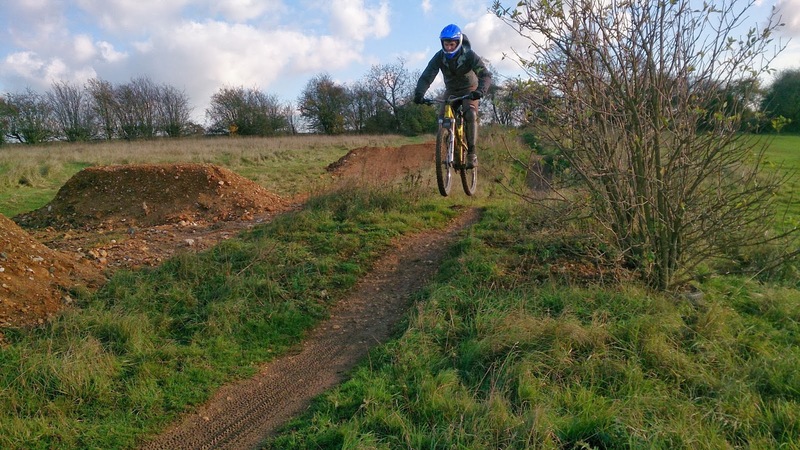 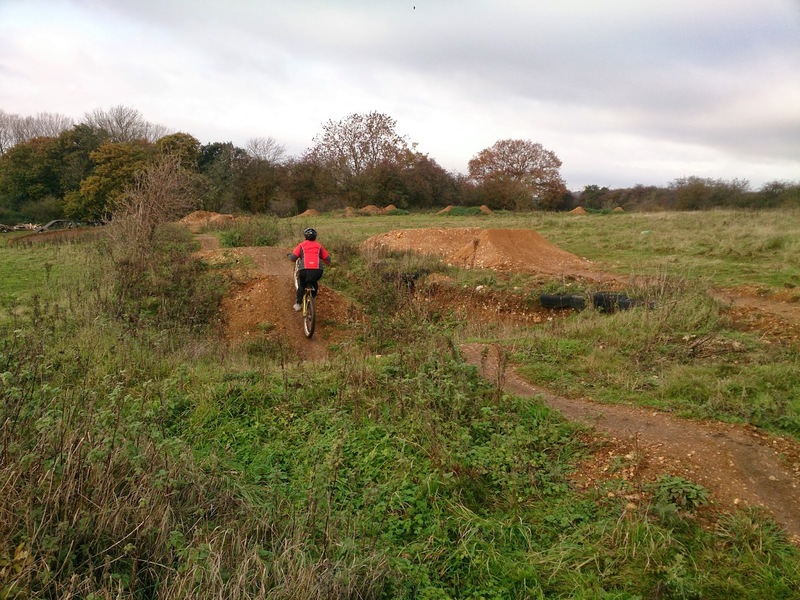 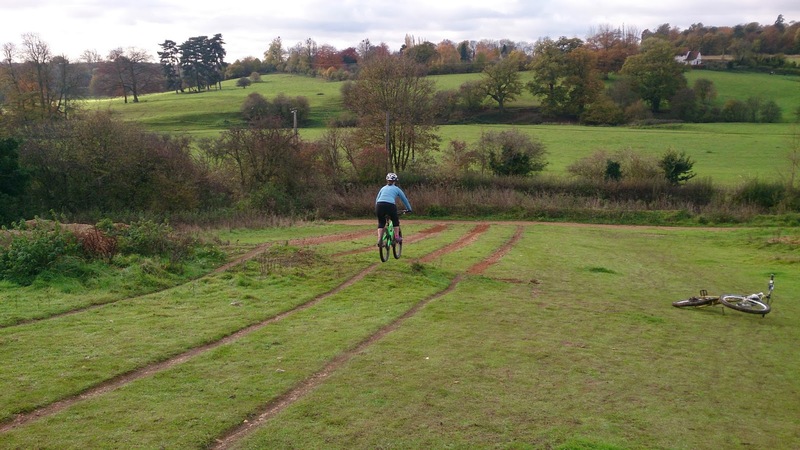 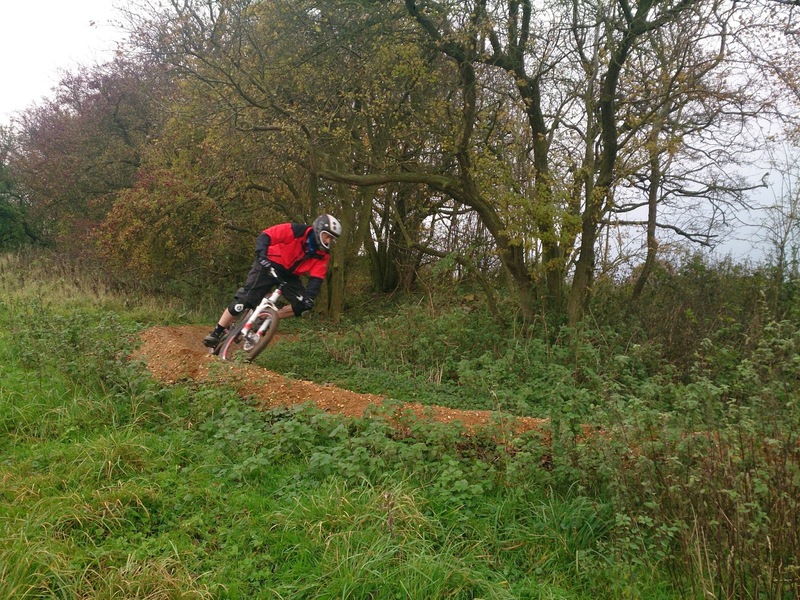 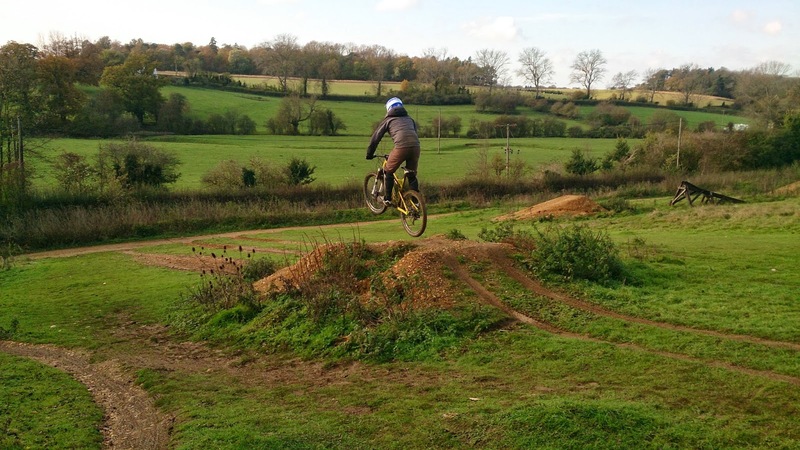 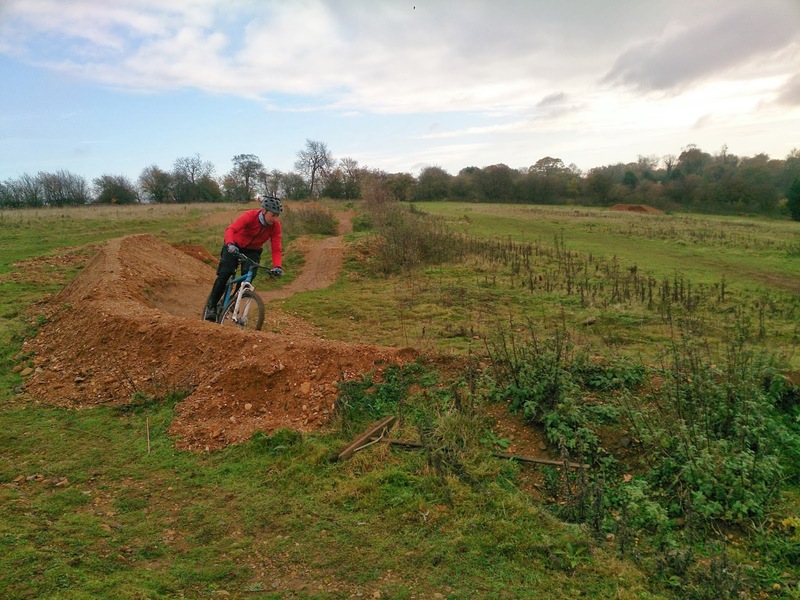 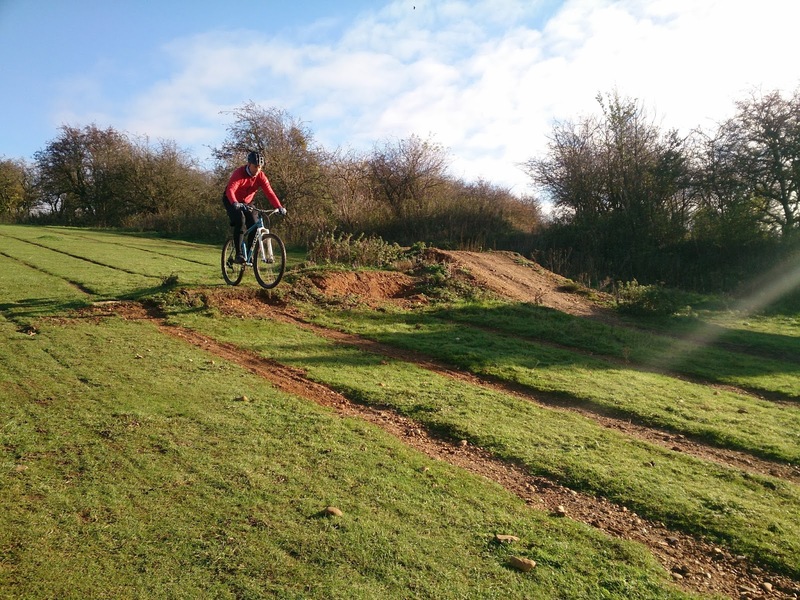 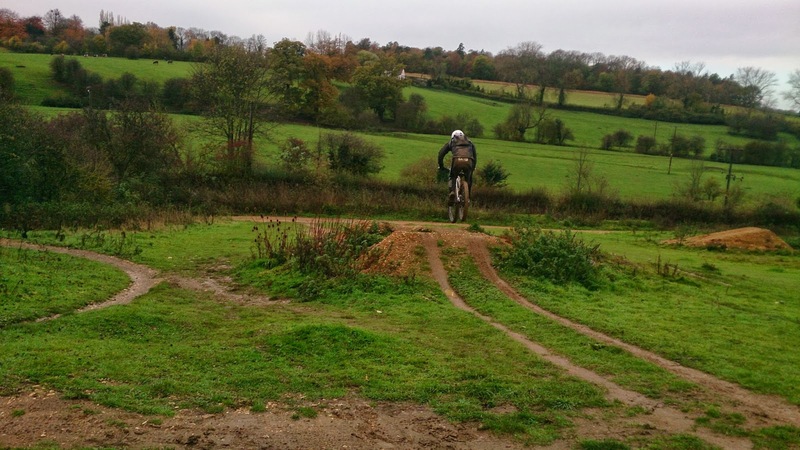 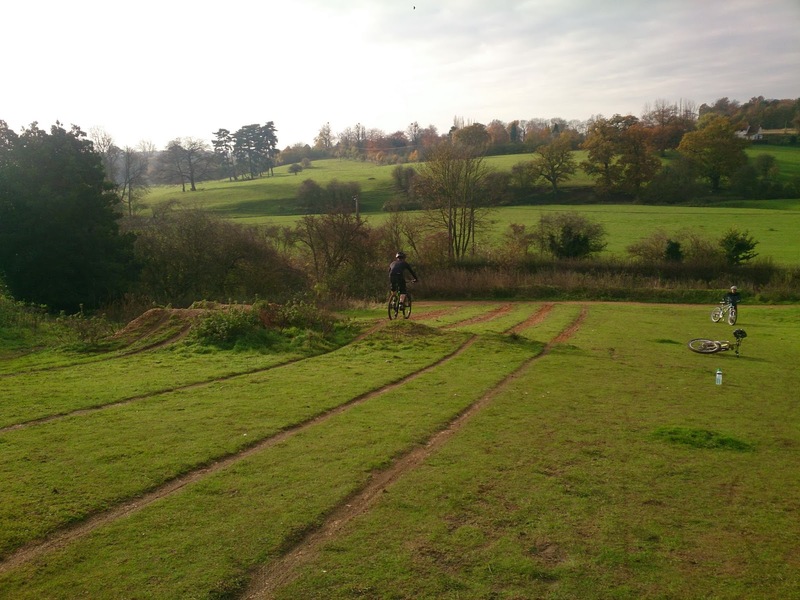 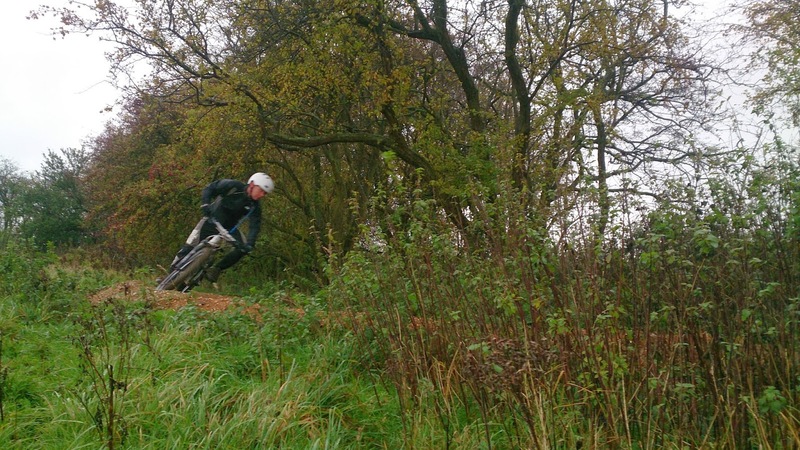 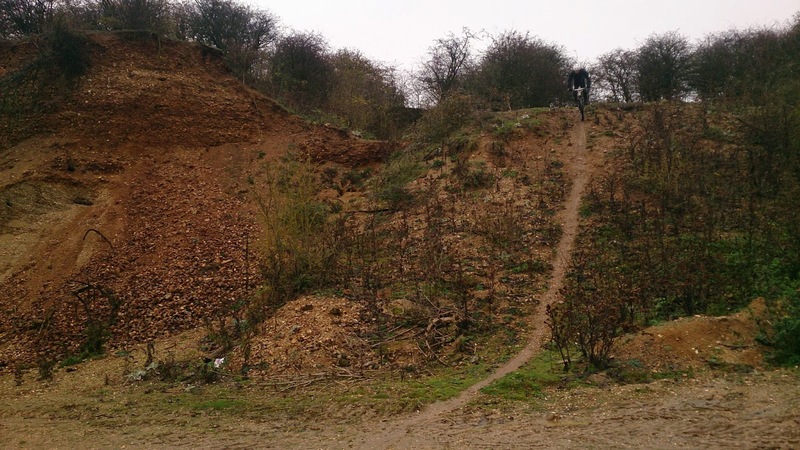 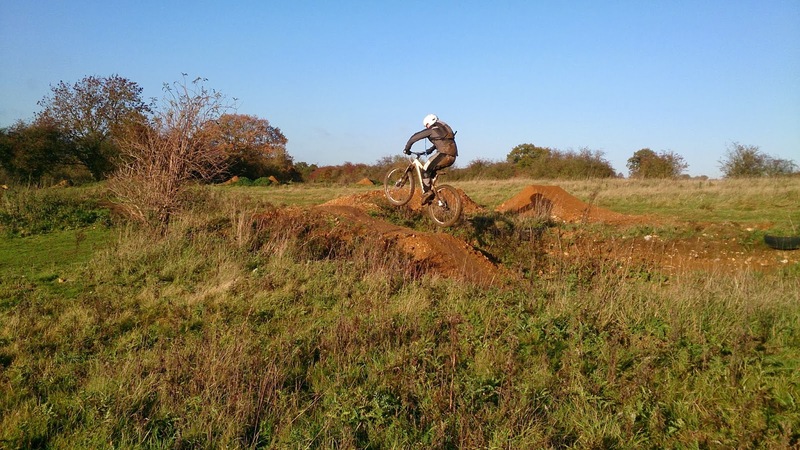 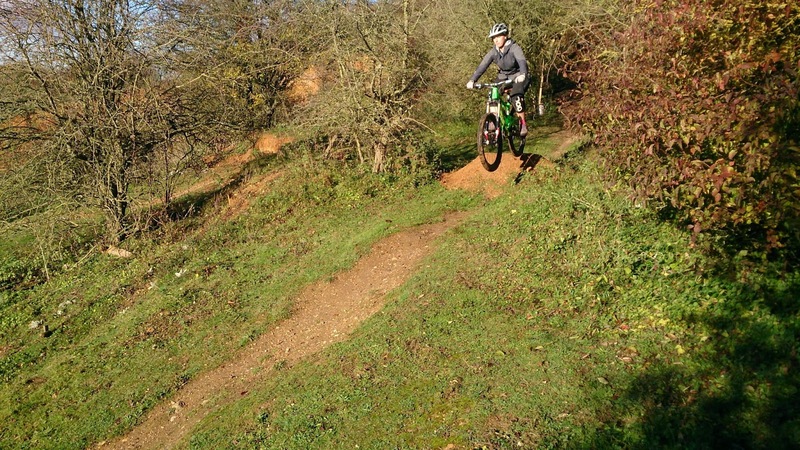 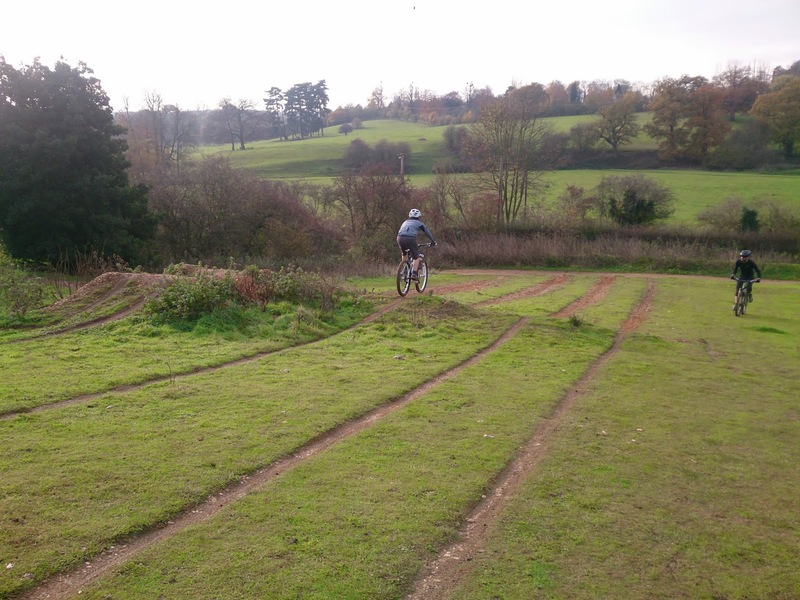 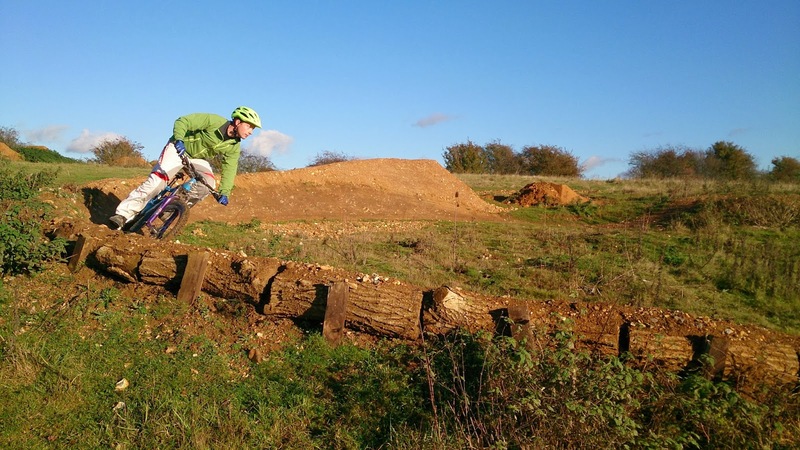 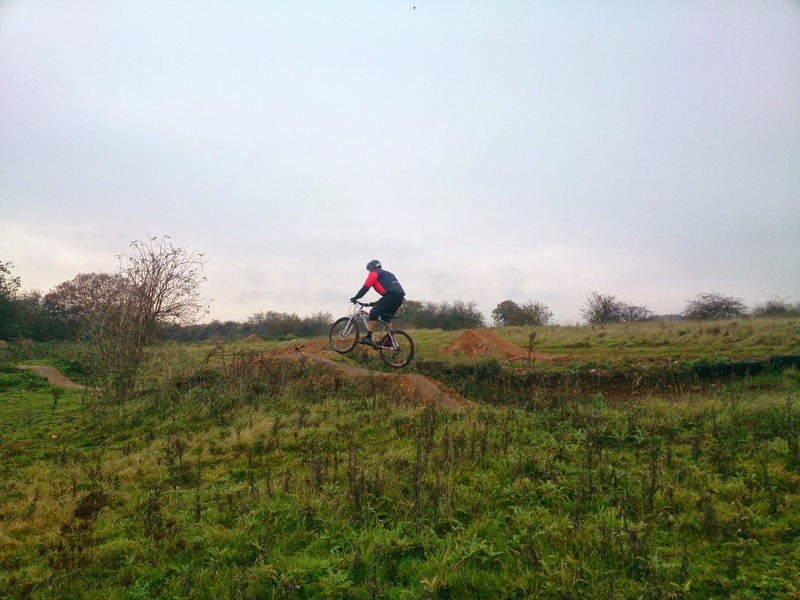 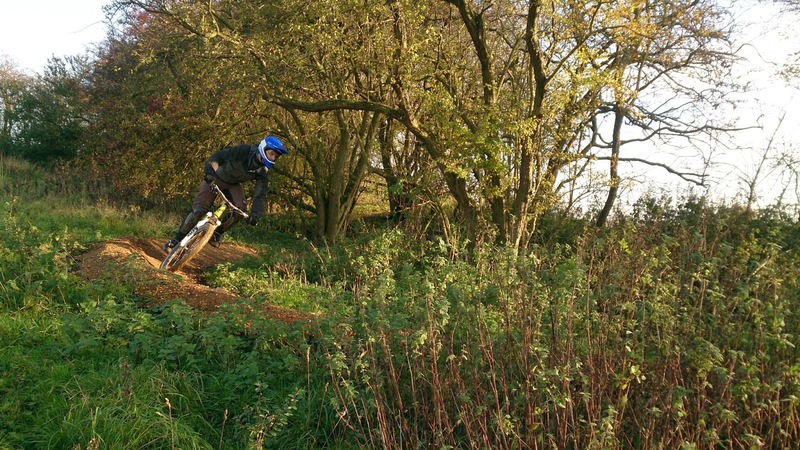 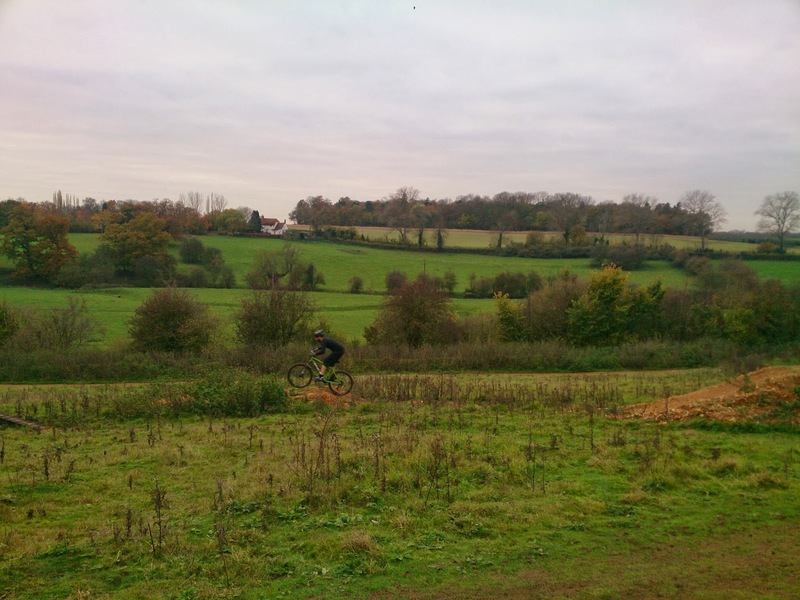 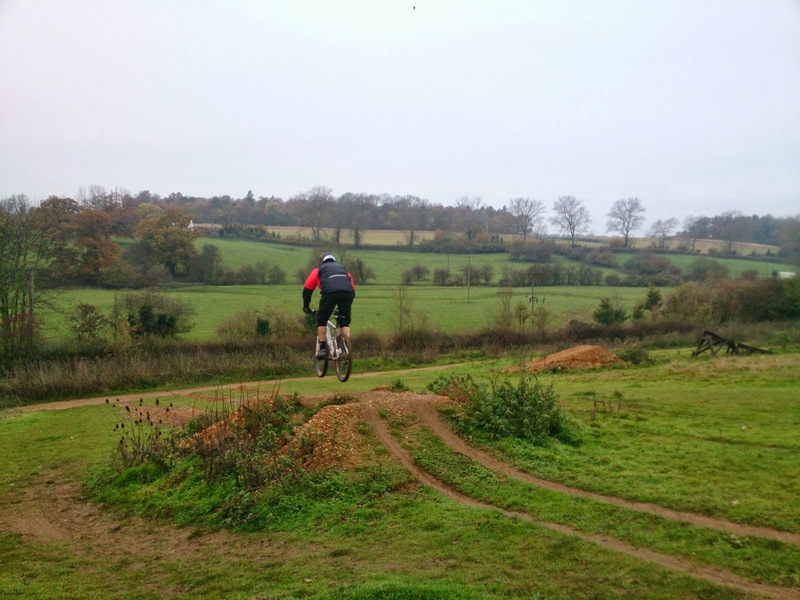 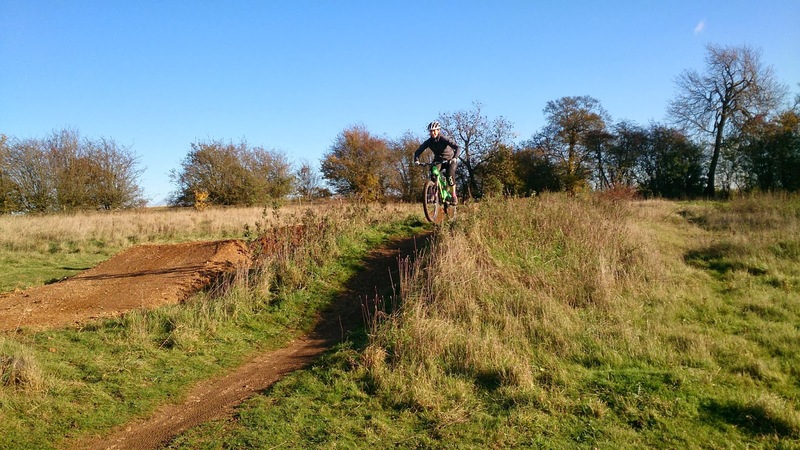 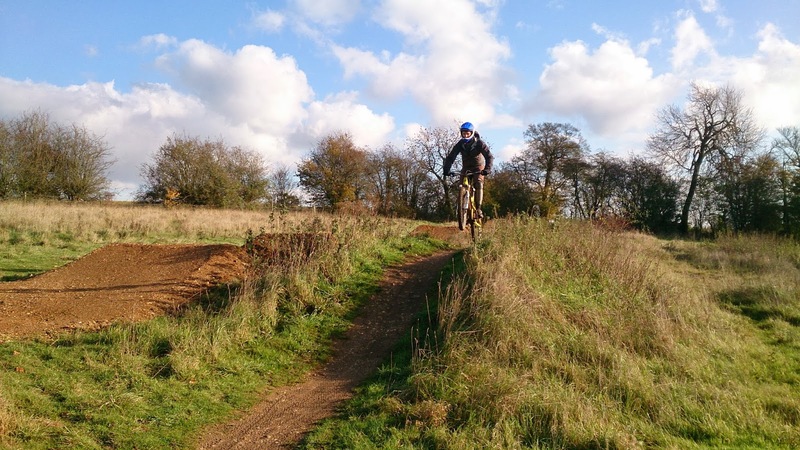 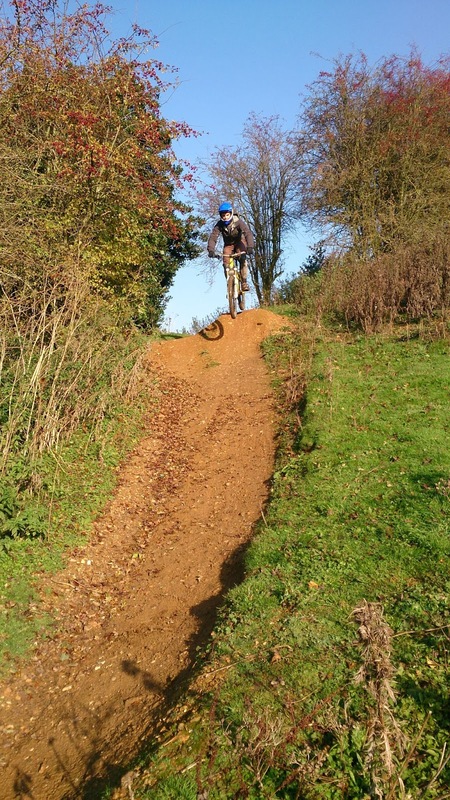 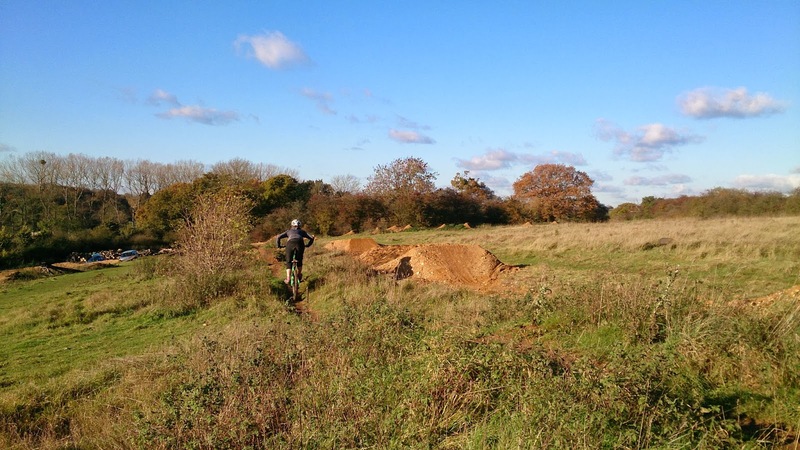 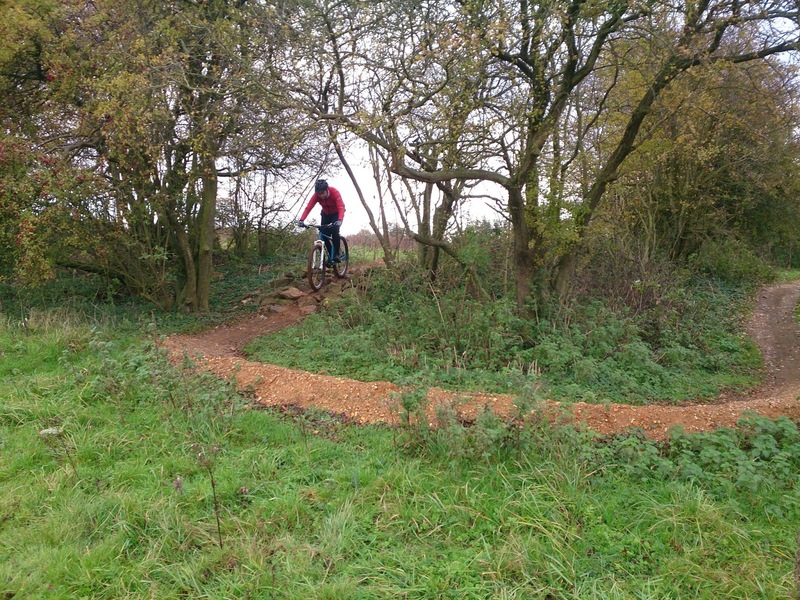 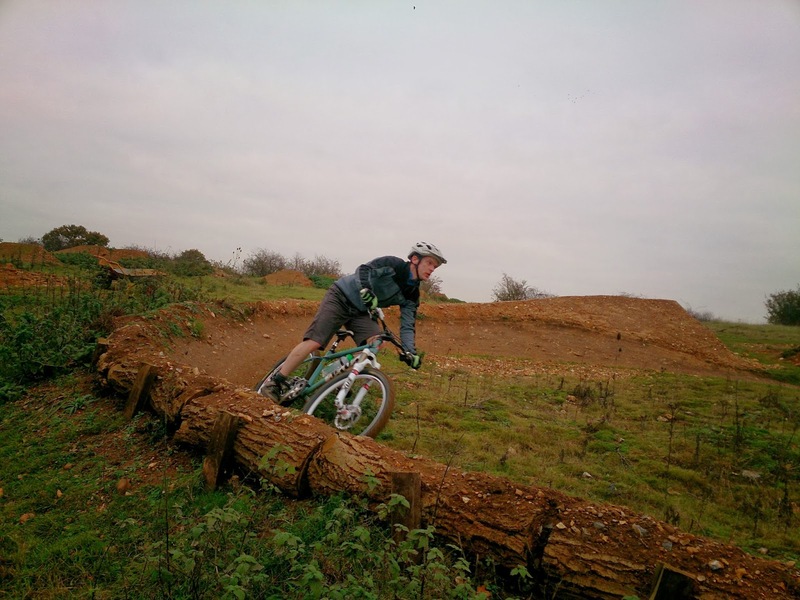 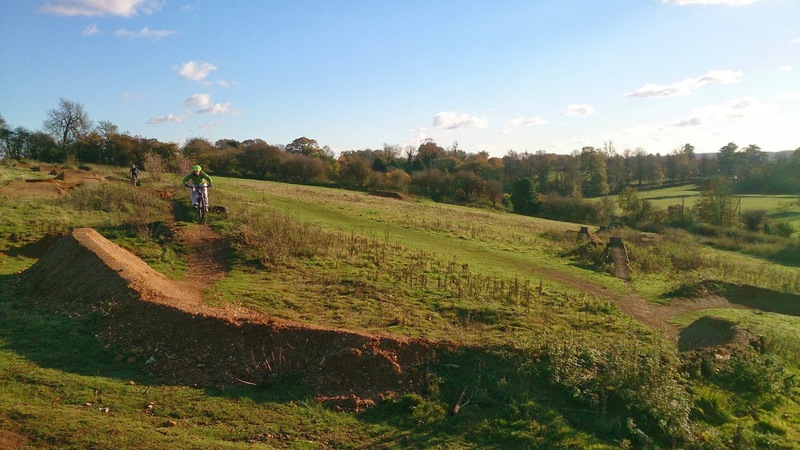 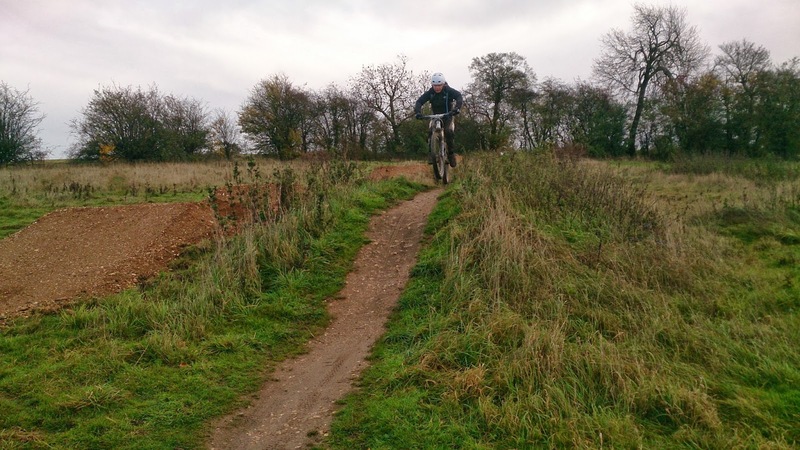 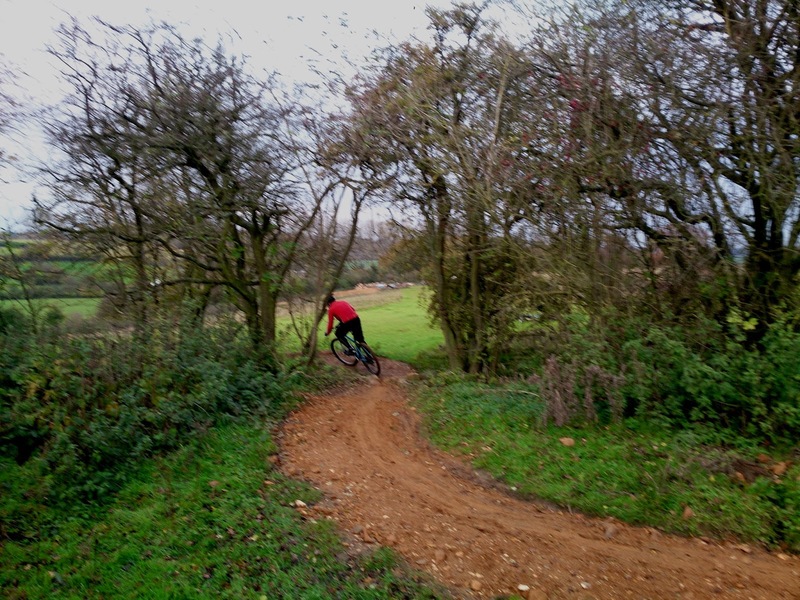 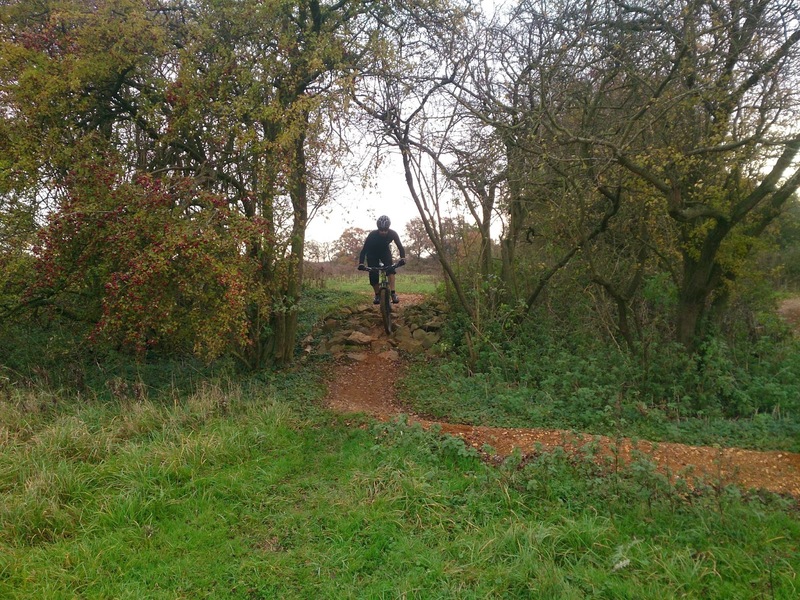 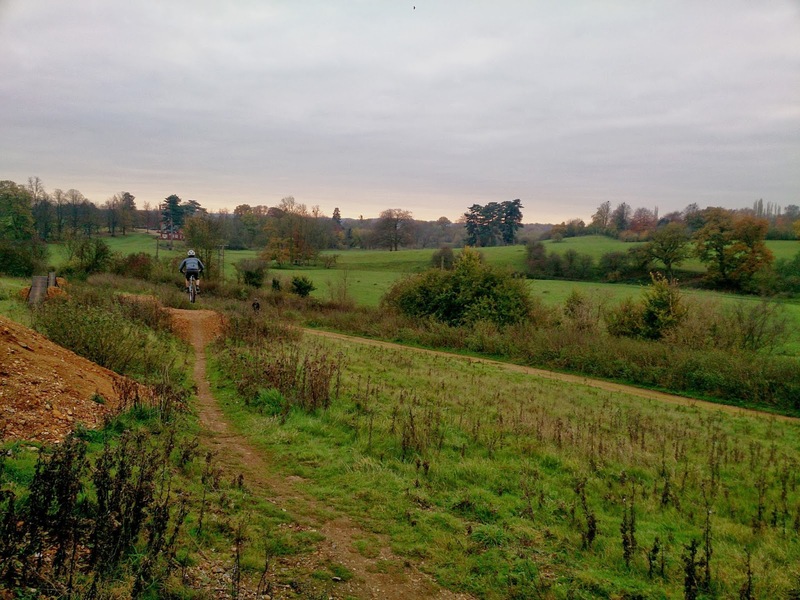 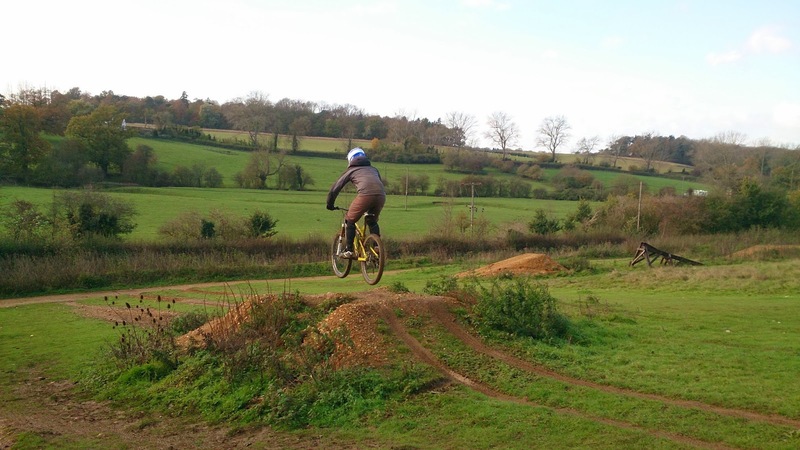 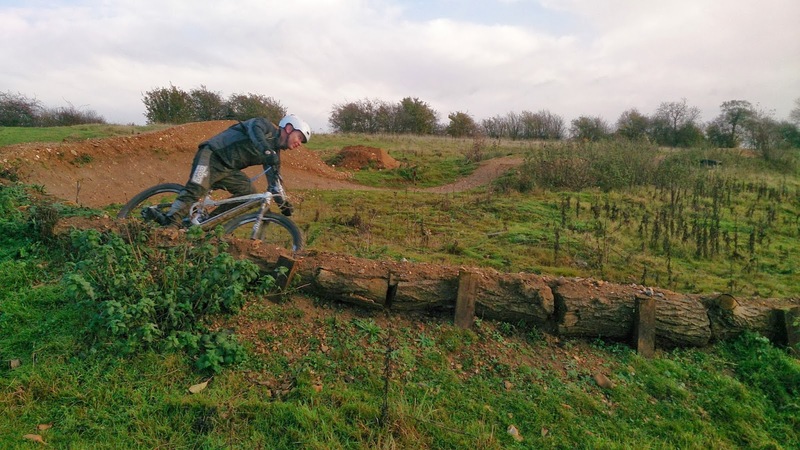 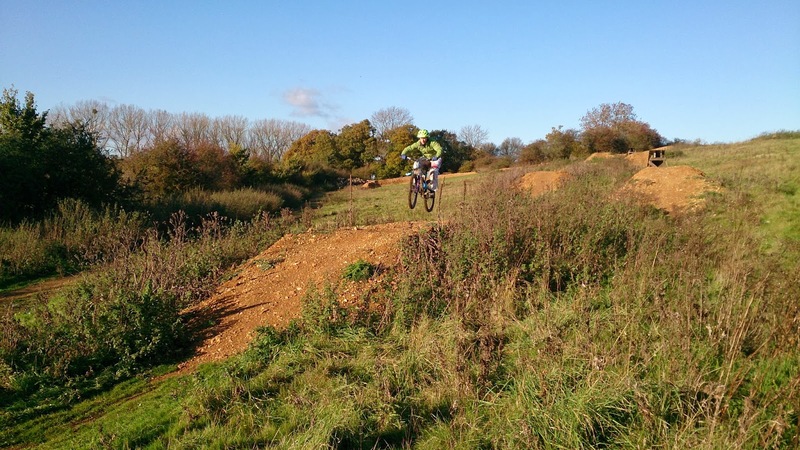 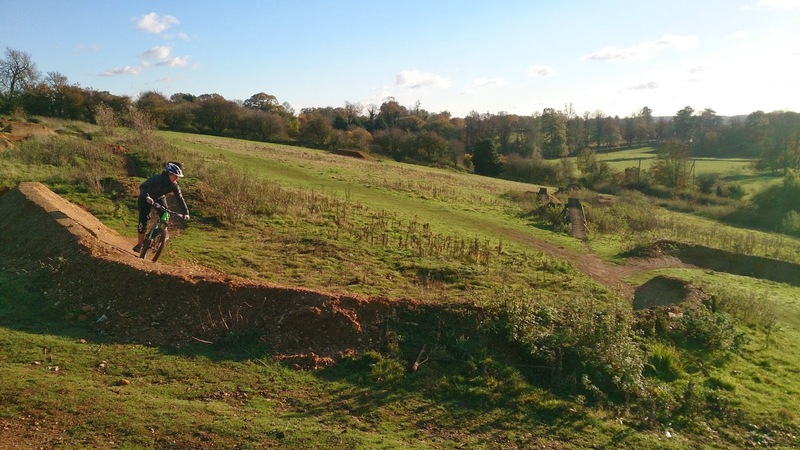 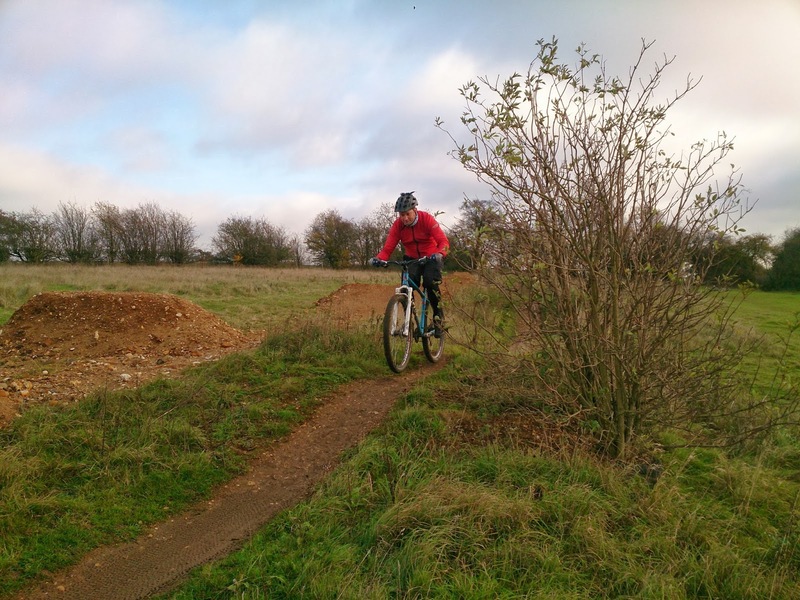 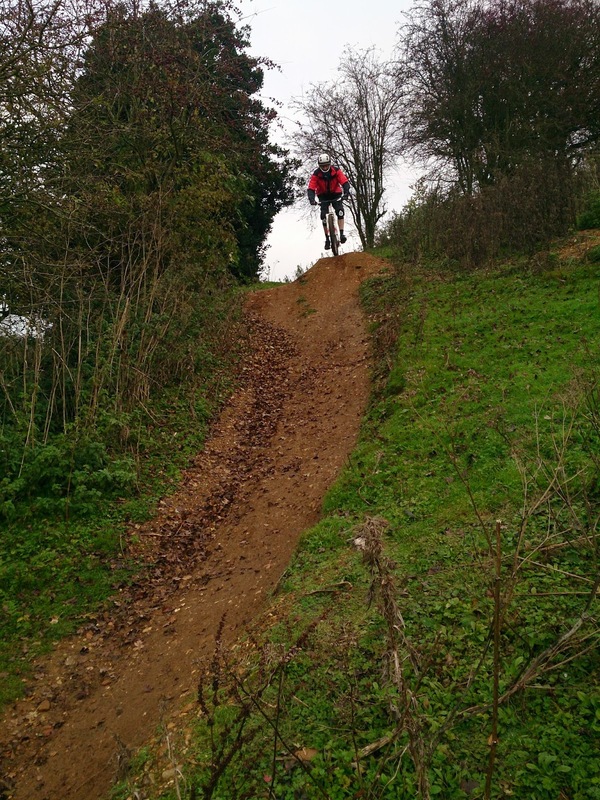 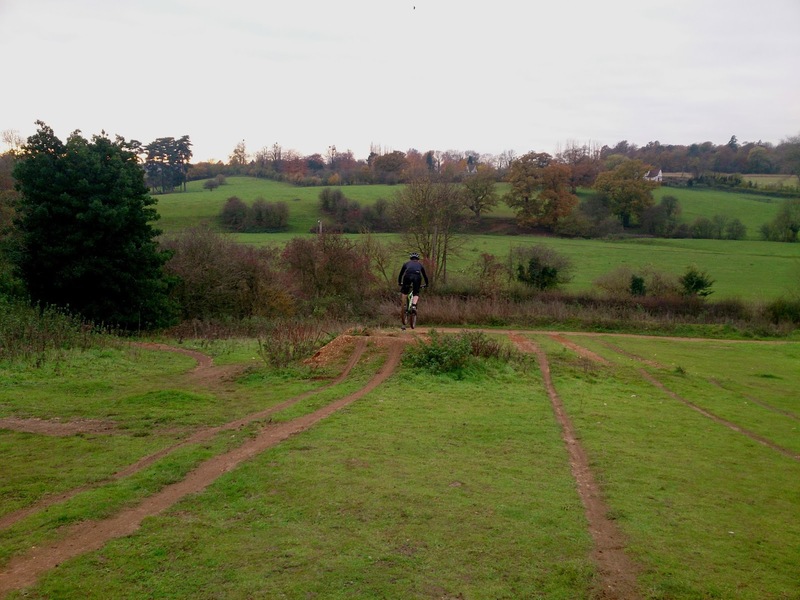 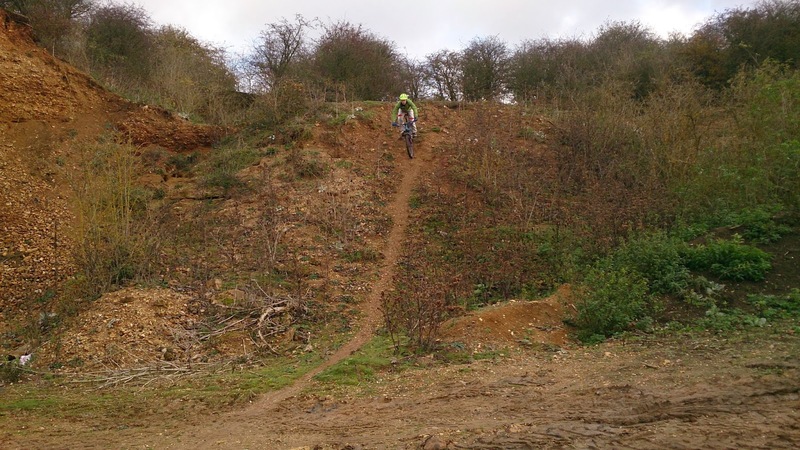 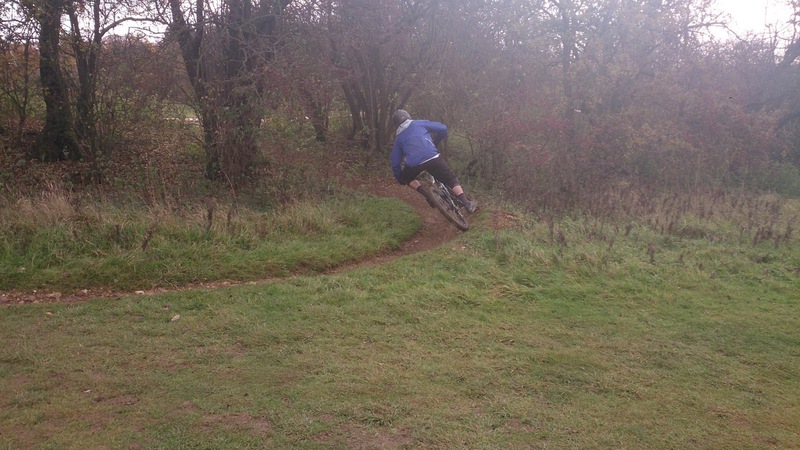 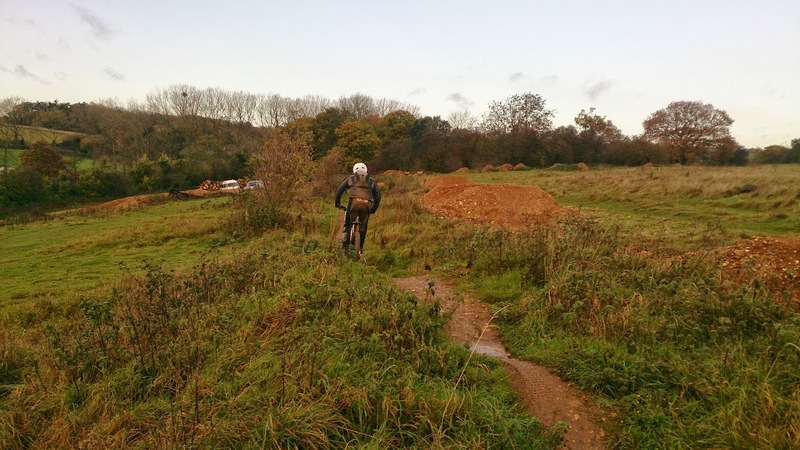 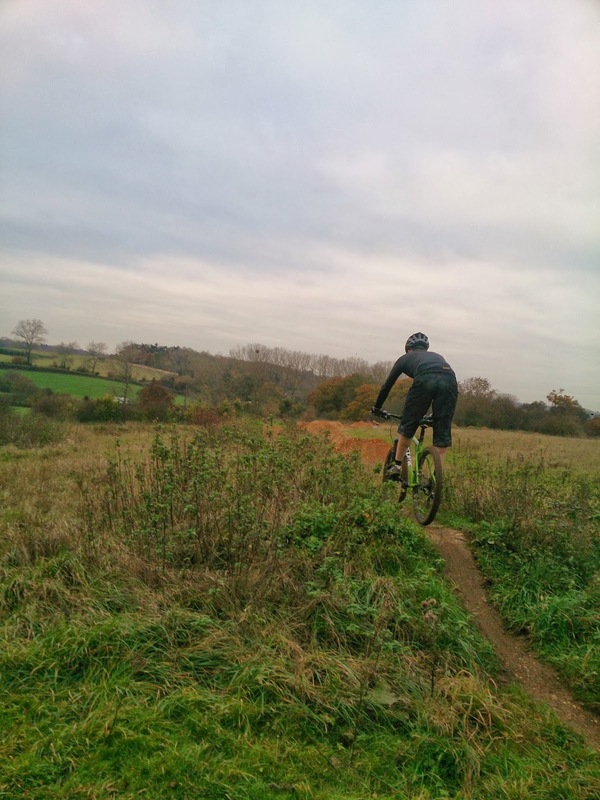 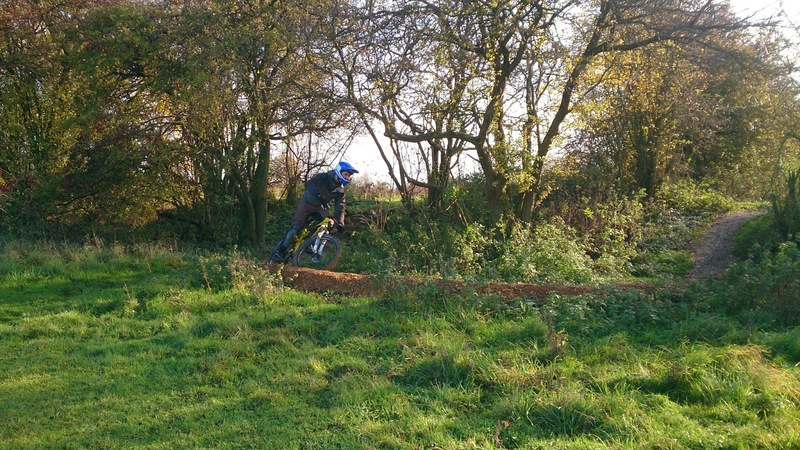 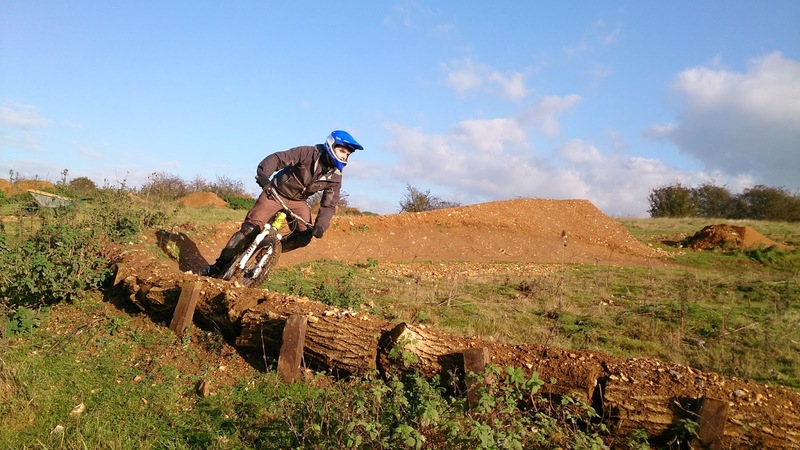 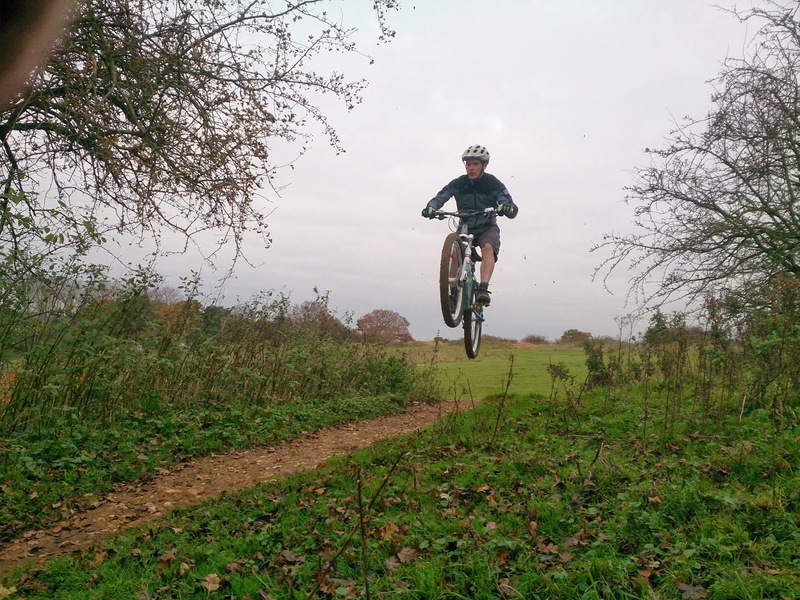 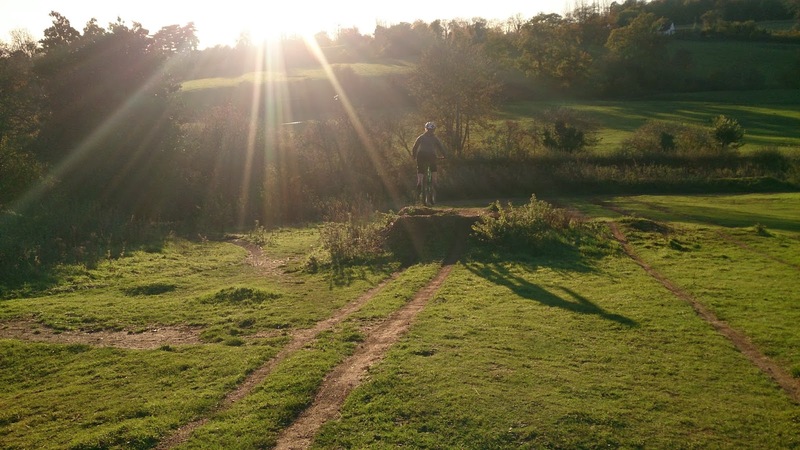 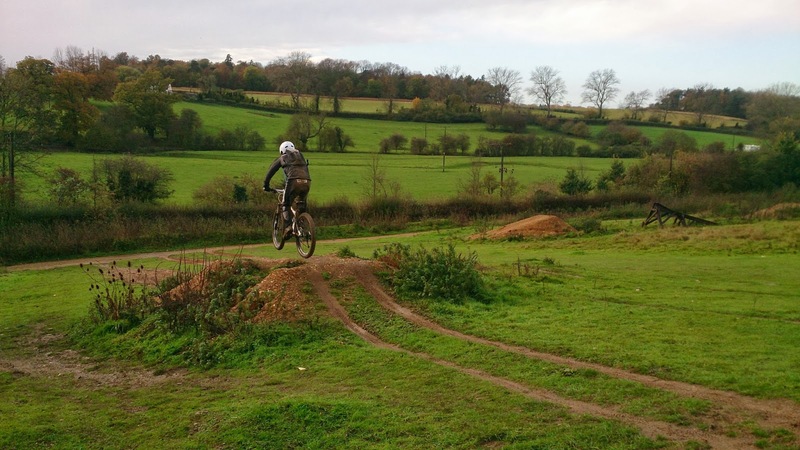 We moved to the skills trail to work on Joe’s cornering and fluidity on the trail and soon he was flying along nicely linking flat, bermed, off camber and switchback turns to pumping, rock gardens, drops, steps and upslopes. 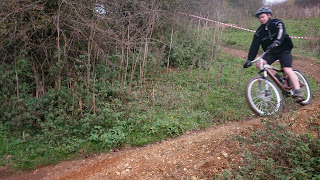 He was carrying speed nicely and any errors were self diagnosed. 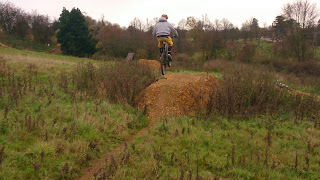 We moved to riding steeps and a near vertical drop off proved no worries now and he was on fire. 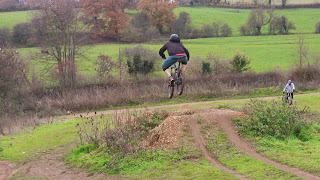 Now came the time to move to his personal fear, jumps. 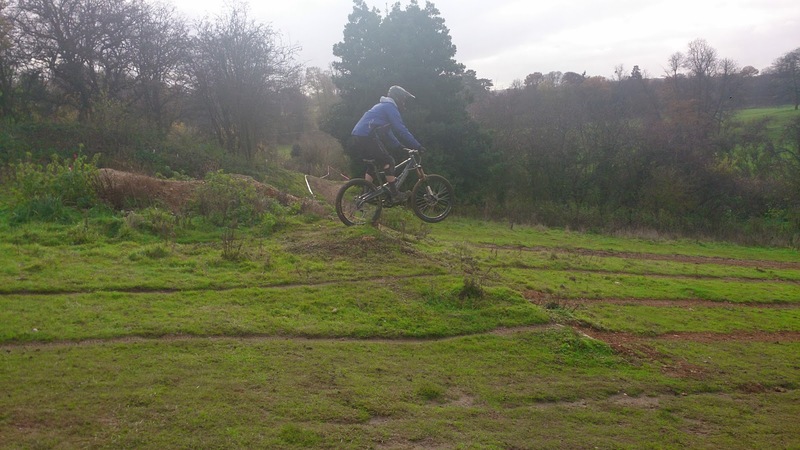 I used 6ft tabletop and gap jumps for this and in a few steps he was sailing over it as the video shows and the gap jump proved no issue either! Onto another trail, and we worked on pumping, manuals and jumping and when and why to choose either technique. 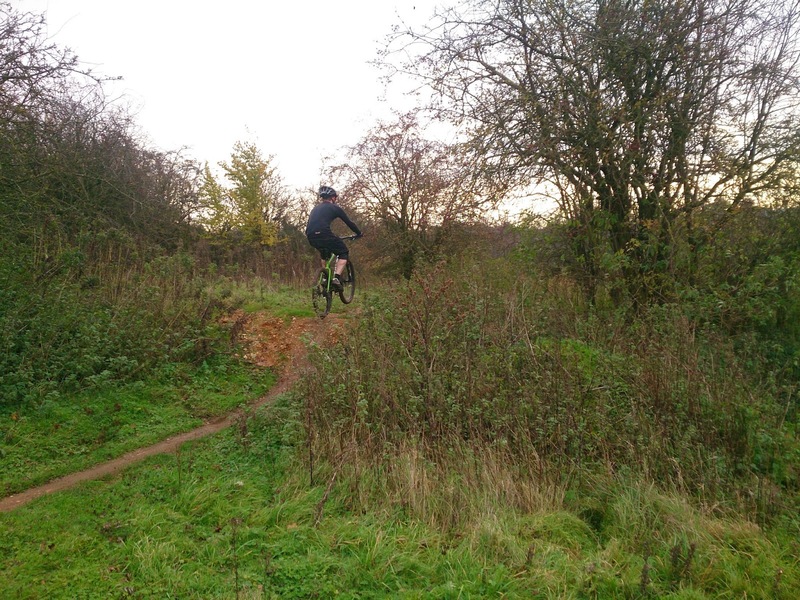 he was really flowing but I could see mental fatigue creeping in as the mental side of our session began to tire him and a move back to the 6ft tabletop was in order before we finished to cement the learning from the session. Awesome riding dude. 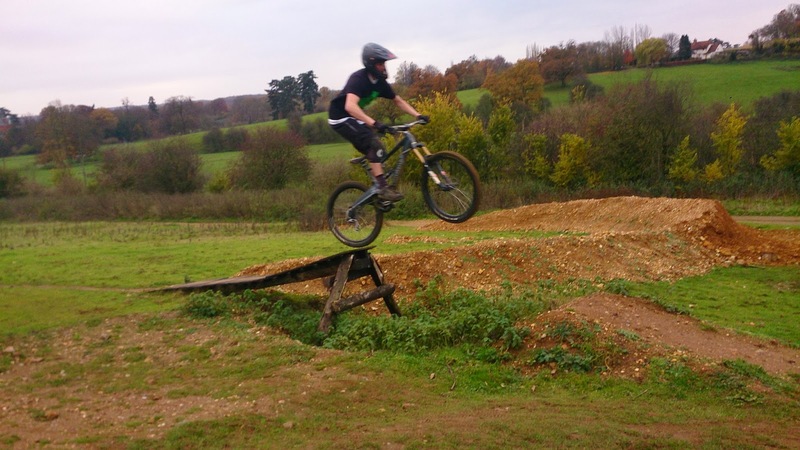 Nick rode motorbikes for years and took up mountain biking 6months ago. 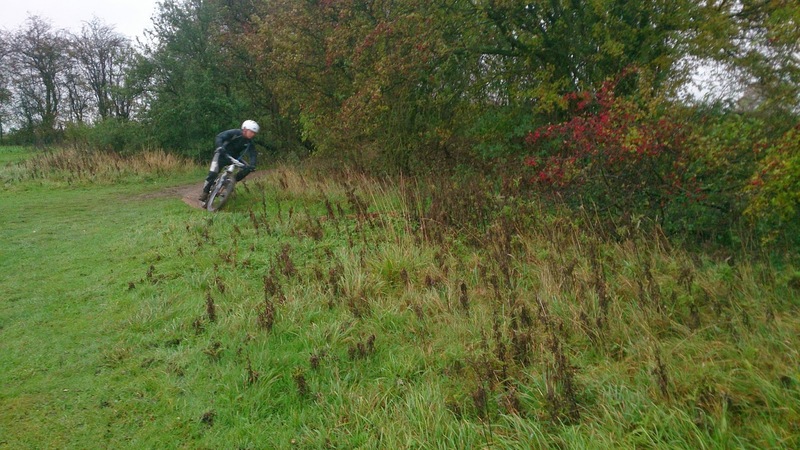 A few crashes saw his riding buddies telling him to do what they did, come see me. 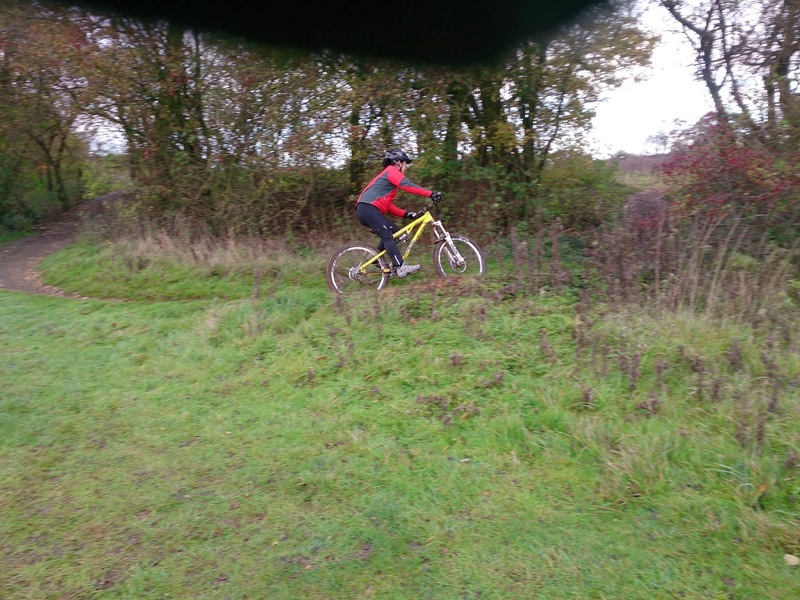 The day arrived and we were greeted by driving rain and wind but that did nothing but solidify the learning as he had more grip than ever once I had corrected his body positioning and looking skills. 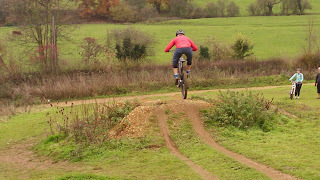 The drop technique blew him away as he landed with ease from all 3 drops. 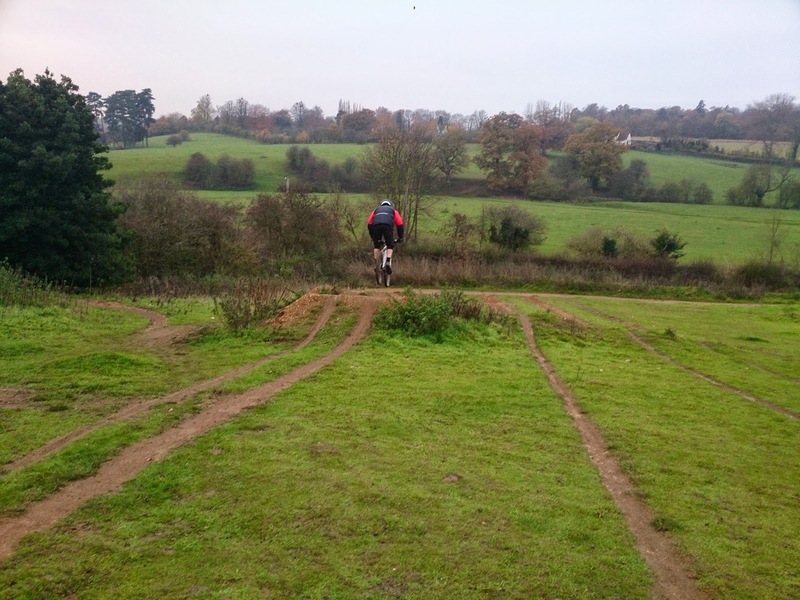 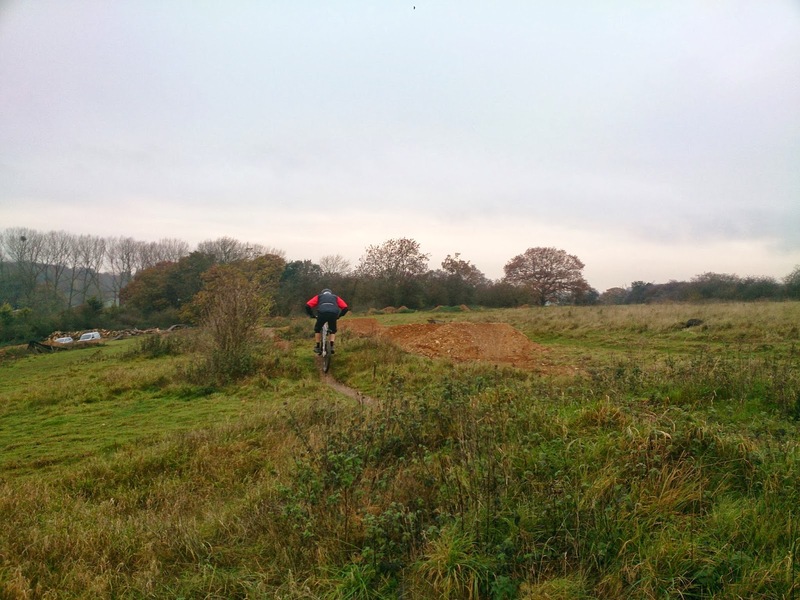 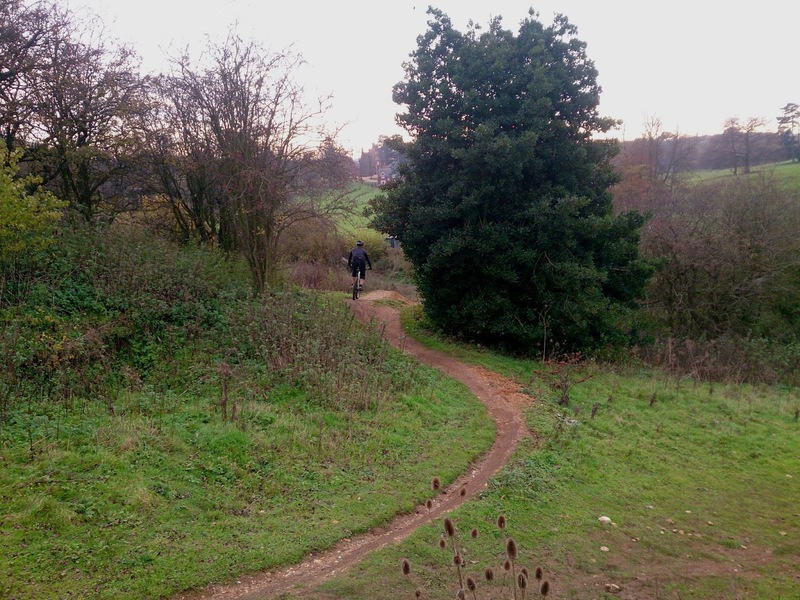 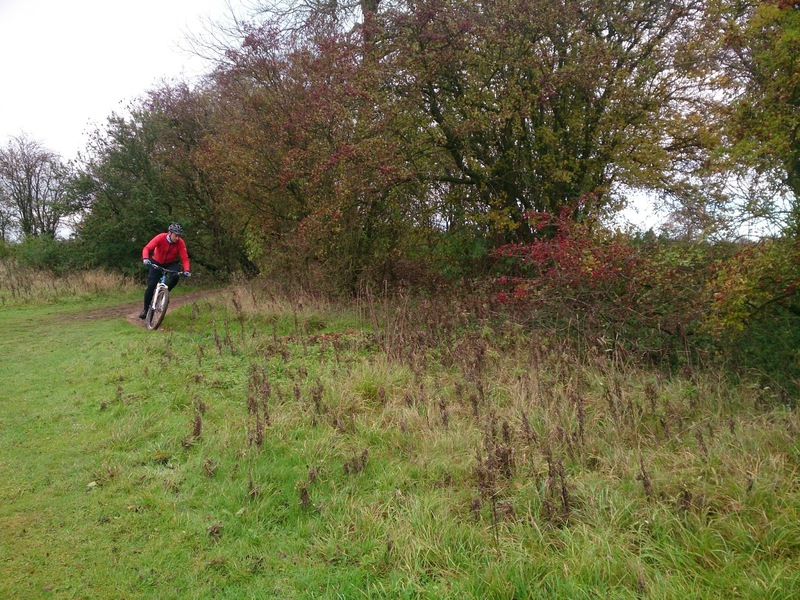 I drilled a body position exercise for his cornering and soon we moved to the skills trail and soon he was riding the trail top to bottom and feeling slow but travelling very fast in the conditions. 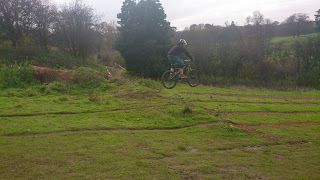 Flat, bermed, off camber and switchback turns were linked to jumps, drops, steps, pumping and rock gardens. 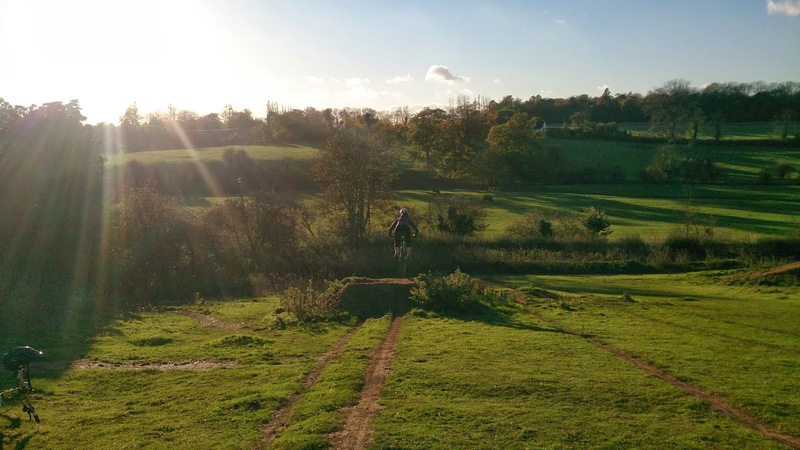 The smile on his face was a picture as he could now travel at a speed he wanted to go and could control it. Next we moved to steeps and i demonstrated two ways of riding down drop offs and when he followed suit it blew his mind at how simple and easy it felt compared to the hang off the back he’d been told. We moved to a 6ft tabletop and now applied his new skills to this technique and in a few steps he was flying over it and landing sweetly, Nick wasted no time in moving to the 6ft gap jump and nailed that too which was his first ever gap jump! 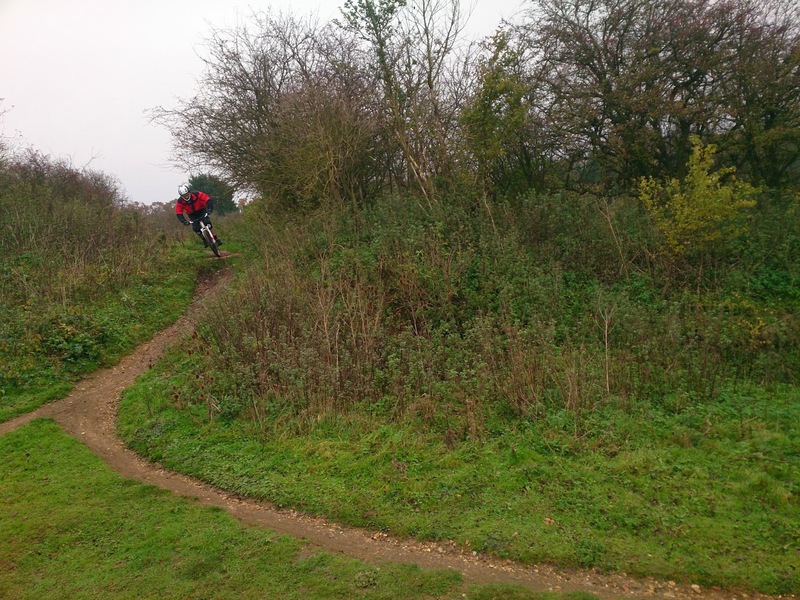 I knew he was tiring both mentally and physically but we had time left in him to move to another trail to work on pumping and jumping multiple sections on a trail and carrying speed through two linked berms. 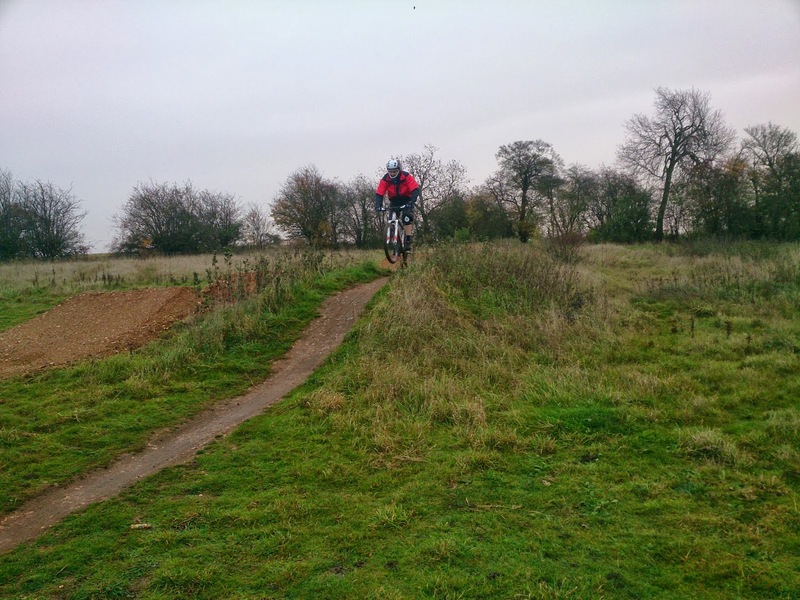 Nick got faster and smoother and a short break gave us more time to dial the step up too as his new body positioning allowed him to pop higher and easier. 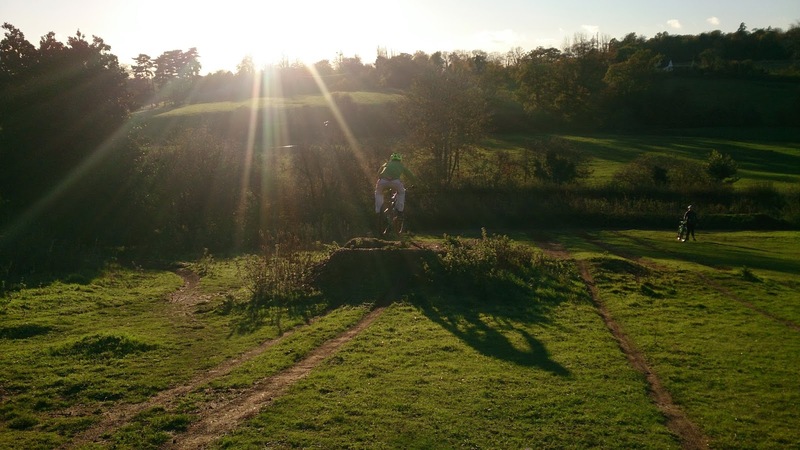 Our session came to a close and I know we’ll ride again soon. Emma and Peter came to see myself for a session 2 years ago and in that time they have built a house and got married and they felt it was time to return to polish their skills set and today was the day. 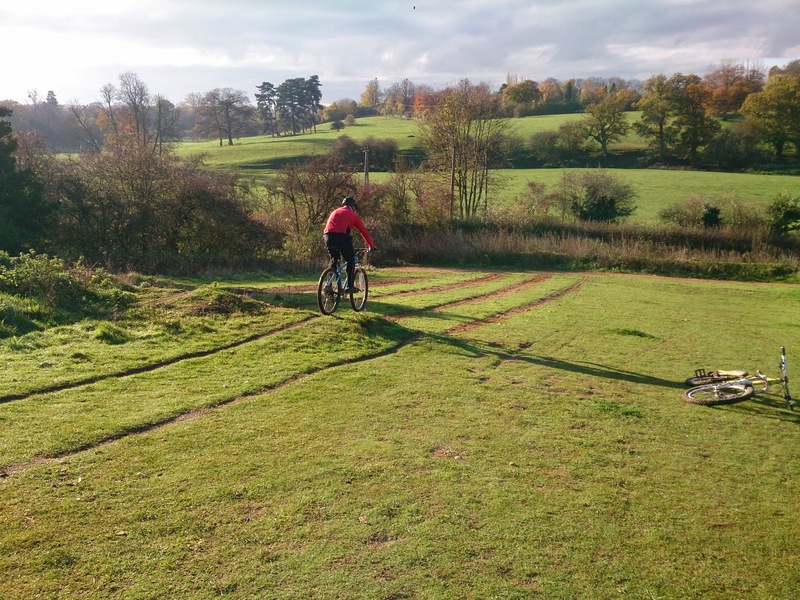 I could see that I needed to work on body positioning in Peters left turns and also Emma’s mental skills set too as we uncovered an area to work on when faced with changed in gradient. 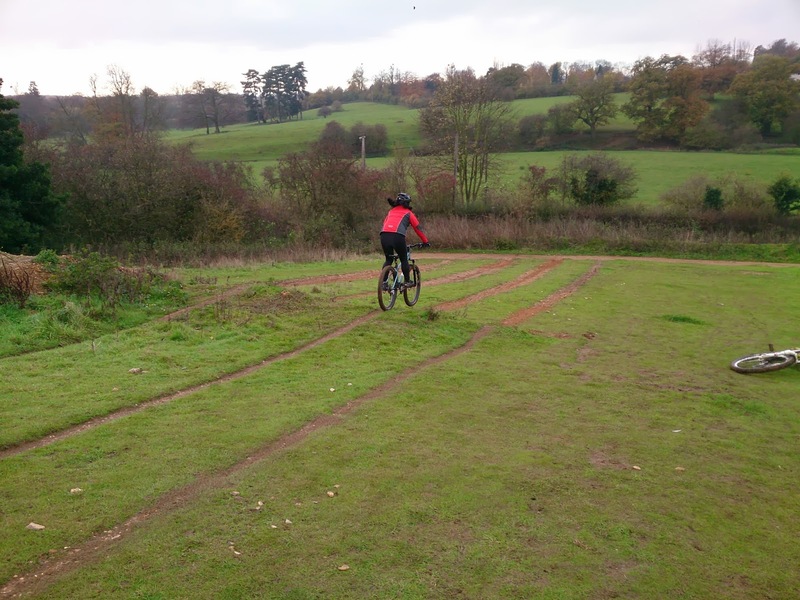 We warmed up on the drops before moving to a trail to work on riding steep terrain and linking sections on a trail that are faster and harder to control and soon they were getting to grips with it and riding down near vertical drop offs with greater control than ever. 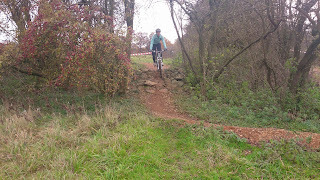 We took a break and resumed with pumping and/or jumping sections on a trail as well as carrying speed through 2 berms that linked. Any errors were being self diagnosed and I could see that Emma had worked on her trail speed management when linking the sections together. 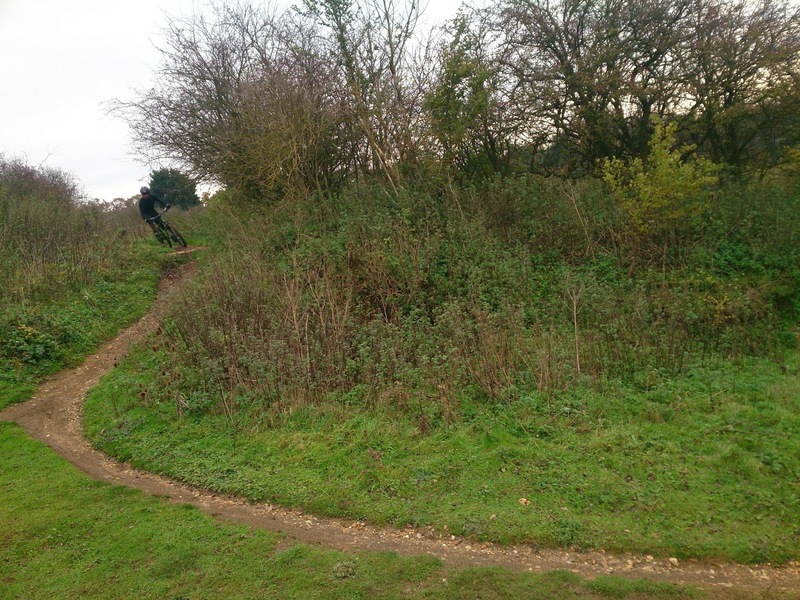 We moved to the alpine style switchbacks and here is where the peripheral fear in Emma appeared and we set about ways to overcome this. 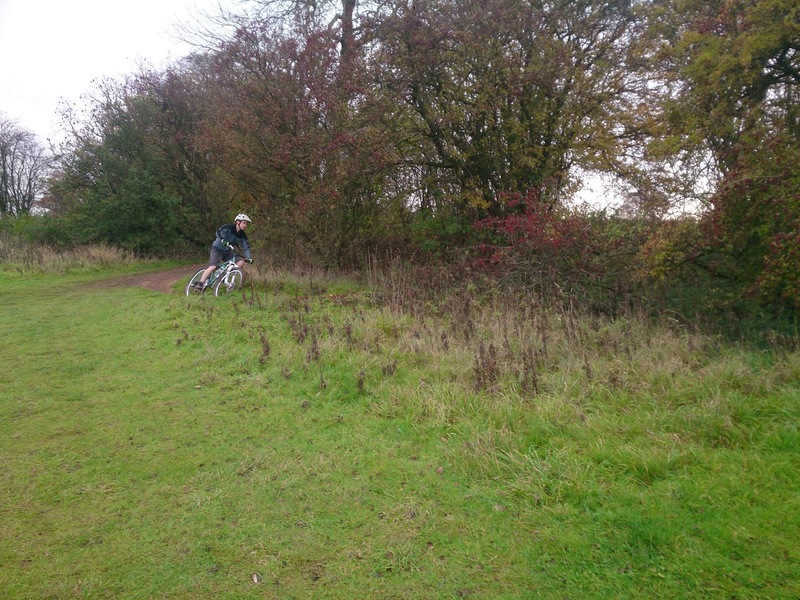 Nathan took time out of his trail building to give a watchful eye on proceedings and nodded in approval at their improvents before carrying on with his work. 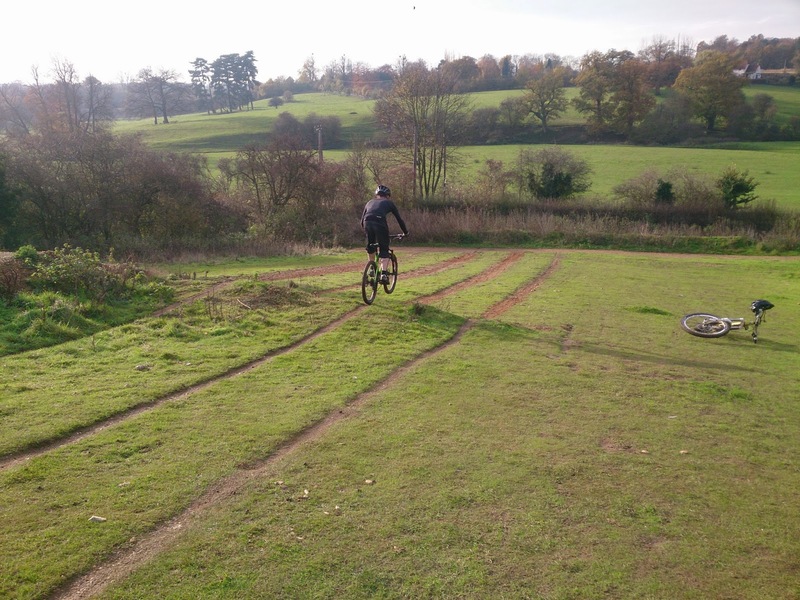 We moved to an isolated 6ft tabletop to work on speed and effort and the required body positioning and soon they were jumping easier and higher than our last session as they had moved on from there. They both rode the gap jump too with confidence and commitment. 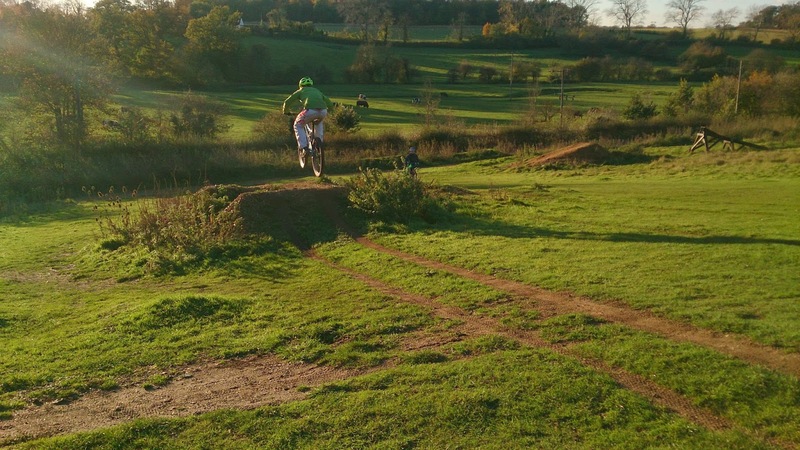 As the sun dropped , our session ended just as Nathan returned nd it was high5’s all around to celebrate a cracking session.